A couple of weeks ago I acquired a collection of letters dating from World War 2. There are billions of similar letters around, but these are special. We are looking at the correspondence of two brothers. One, Walther, is a young professional soldier who his trying hard to become an officer (finally getting his promotion in January 43). The other is Theo, a student in a German grammar school, who aches to finish school to be able to become a soldier aswell and to follow in the footsteps of his elder brother. The whole correspondence ends in September 1943. A check with the Volksbund database tells us why. Walther is missing since October 1943, his body has never been found. The brothers speak openly about their fears, their wishes and their dreams and whereas the younger brother is working hard to become a soldier and an officer himself, his elder brother seems to lose confidence and motivation constantly. 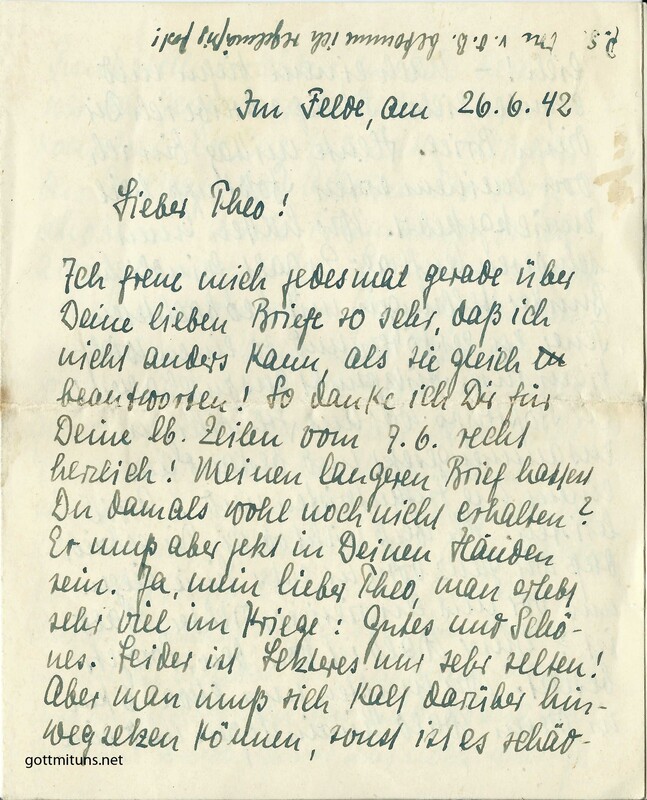 I have chosen a random letter to start with, an interesting one dated 26th of June 1942. Walther is serving as an Unteroffizier (NCO) in Artillerie-Regiment 299 which is deployed on the Eastern Front. I will continue to publish them in chronological order as soon as I find the time. every time I receive a letter from you I am so happy that I just have to answer them immediately. My heartfelt thanks for the lines you sent on the 9th of June. You probably had not received the long letter I sent you? I hope you are holding it in your hands by now. Dear Theo, I can tell you that there is a lot to see in war. Bad things and good things. Sadly you see the latter very rarely, but you have to be able to ignore that, because otherwise it would be hard to bear. After a long and refreshing sleep I am now writing you this letter. This evening I returned safely from my first combat patrol. Our task was to destroy an important enemy position consisting of a number bunkers with observed fire. The patrol consisted of volunteers and was made up by a platoon of infantry and three artillerymen. I do not remember if I have told you that we lie in the foremost line and right in front of it is a large and thick forest which is held by the Soviets. We had to advance about 4 kilometers into it and set up a radio station, with which we could guide the fire of our battery. The job of the infantry was to secure us against any kind of Russian counter action. My dear Theo, I had no idea, what I had volunteered for! It’s not that I feel sorry about it, but it was a real suicide mission. Three weeks ago another combat patrol was sent out into this primeval forest where it was ambushed and wiped out by the Soviets. After that the number of volunteers for such missions drastically decreased! The Russian is a beastly, malicious and devious enemy who is committing unspeakable deeds to the wounded and to the ones he takes prisoner. Theo, if you ever have to see a comrade that has been ravaged by them you will never forget it. The one we found had been in command of the previous combat patrol. There was a burning inside me, my blood was boiling and I didn’t know what to say. He had only just been awarded the Iron Cross 1st class. I will never be able to forget this sight. But you have to get rid of it. You have to forget it. If you don’t it will make you fail. We slowly moved forward, stopping about every 20 meters, listening into the wilderness. That way it took us 5 hours to reach a part of the forest from which we could observe the enemy bunker line. The moral effect of our artillery rounds zooming over our heads and punching into the enemy position was wonderful. A tremendous feeling, which is hard to describe to someone who has not experienced something like that! The Soviets had obviously not noticed that they were being hit by observed fire and their artillery started to open up aswell. Our guns managed to crack open two of their bunkers. After two hours of continuous firing we started to withdraw, but by then Ivan had finally realised that there had to be German artillery observers around. All of a sudden he opened up with everything he had and small arms fire was ripping into the forest around us. We had chosen a good spot though and did not suffer any losses. During our withdrawal we had to cover two dangerous spots ideal for an enemy ambush. One was a patch of grassland surrounded by dark forest, the other a swampy area covered with gravel. Both would have given the enemy a perfect opportunity to annihilate us, but nothing happened. We arrived at our position and were more than happy to have escaped from this hell with all our bones intact. This forest is really a hell on earth which has cost us a lot of blood so far. It’s easy to enter, but terribly hard to get out again. The damned Ivan invites us in and then easily surrounds and ambushes us. An easy game in his position. Why don’t we just take the forest you ask? Our operations are to make sure that he does not (!) retreat without a fight. It is planned that in a few weeks from now a large-scale operation will be conducted with the goal of destroying the Soviets completely and you can only do so if the enemy faces you in combat. But what happens you allow him to withdraw and to continue his existence? Dear Theo, with these lines I just wanted to give you an idea of our life here. At the moment I am back at the observation post. I would not like to be anywhere else as there is no better place to prove and show what is expected of the future officer. In the future more patrols will be send out and I will make sure I will part of them. PS. It’s Mother’s birthday on the 3rd of July! In “Generals of the North“, I will introduce the Generals of Army Group North (Heeresgruppe Nord). Not a lot has been written about them and outside germany most people will not even have heard of them. Everybody has heard of Rommel, Guderian and Manstein, but names like Küchler, Lindemann, von Bock, Frießner, Schörner and von Leeb have largely been forgotten. Georg Lindemann was born on the 8th of March 1884 in Osterburg. On the 26th of February 1903, after finishing grammar school he joined the “Magdeburgische Dragoner-Regiment Nr. 6” (Dragoons) as an ensign. After being promoted to the rank of Leutnant he joined “Jäger Regiment zu Pferde Nr. 13” in Saarlouis on the 1st of October 1913. His stay there was a short one as on the 1st of April 1914 he was transfered again, this time joining the the “Grosser Generalstab” (generals staff) in Berlin. This was unusual as Lindemann never visited the war academy. During his staff service he made the acquaintance of his future superior Georg von Küchler. In the years prior to the Great War he had married Annemarie von der Osten the mother of his three children (Ernst, Rosemarie and Erika). 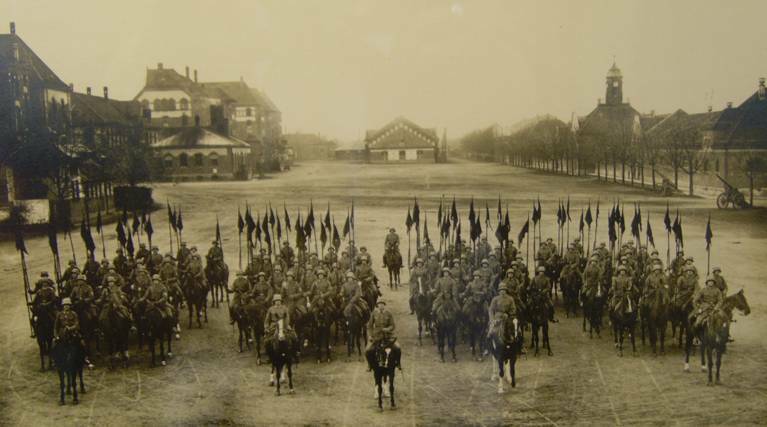 The outbreak of the war in 1914 brought an end to his staff training. When his regiment mobilized he returned to it and got the promotion to the rank of Rittmeister shortly afterwards (November 1914). During World War One he served in the generals staffs of “Korps Posen” (6th of December), “Garde-Reserve-Korps” (February 1915), “Armeeoberkommando 12” on the Eastern Front (June 1915), “Armeeoberkommando 11” on the Balkans (October 1915), “VII. 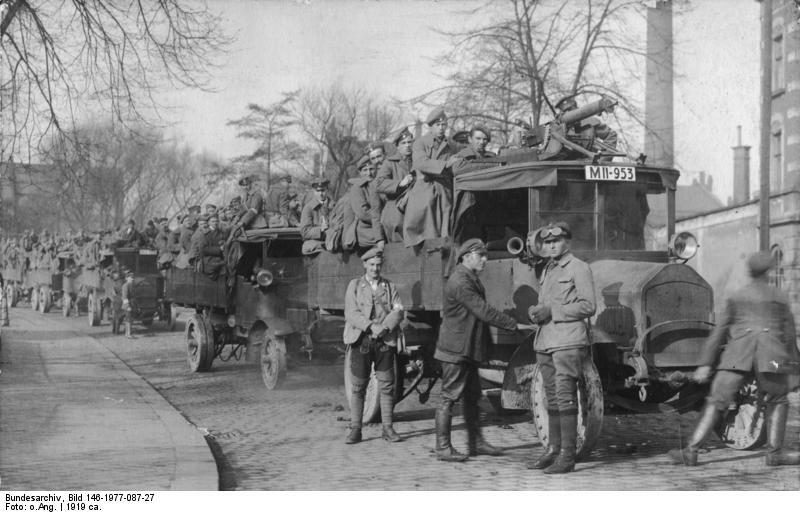 Reserve-Korps” (March 1916) and “Armeeoberkommando 1” on the western front (Juli 1916). On the 12th of January he was made chief of staff of “220. Infanterie-Division” a position he continued to hold for more than a year before being posted to “Heeresgruppe Kronprinz Rupprecht von Bayern” as a liaison officer (Offizier von der Armee). During World War One he was awarded with the Iron Cross 2nd Class (September 1914), the Iron Cross 1st Class (July 1915) and the Knights Cross of the House of Hohenzollern with Swords (May 1917). Believing that “Saving the Reich, any kind of Reich, from the fall” should be his first and foremost goal, he joined the Freikorps and took part in suppressing communist risings in Munich, Halle, the area of the Ruhr and Hamburg. 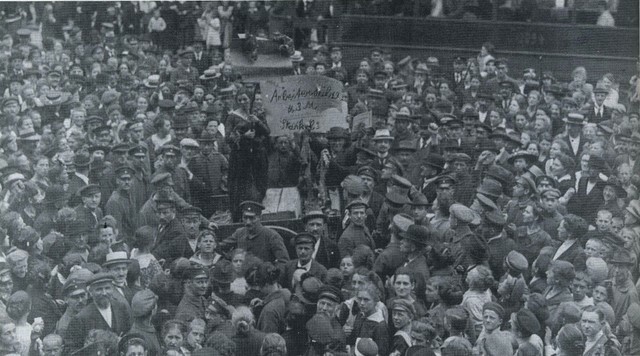 The “Sülze-Unruhen” in Hamburg 1919. Reason for the risings was rotten meat used and sold by Hamburg butchers. On the 10th of March 1919 he joined “Grenadier-Regiment zu Pferde Nr. 3”. Only 13 days later he was transfered to the staff of “Garde-Kavallerie-Schützen-Division” which was part of the “Freiwilligen Division von Lettow-Vorbeck”. With this unit he took part in the suppression of the Munich Räterepublik (council republic) and the so-called “Sülze Unruhen” (“Aspic” risings) in Hamburg (1st of July 1919). Soon afterwards Lindemann left the Freikorps. In August 1919 he got transferred to the Garrison of Hamburg, Altona and Wandsbek as a staff officer before being posted to the Infantry-School Munich as an instructor in November 1919. When Lindemann was taken over into the Reichswehr in 1921 he stayed in his old position as infantry instructor. On the 15th of September 1922 he took command of the 2nd squadron of “Reiter-Regiment 7” in Breslau. Three years later, in 1925 he was transferred to the staff of 2. Kavallerie-Division and was promoted to the rank of Major, Lindemanns first promotion after 12 years of continuous service! After being promoted to the rank of Oberstleutnant on 1st of February 1931 he took command of Reiter-Regiment 13. 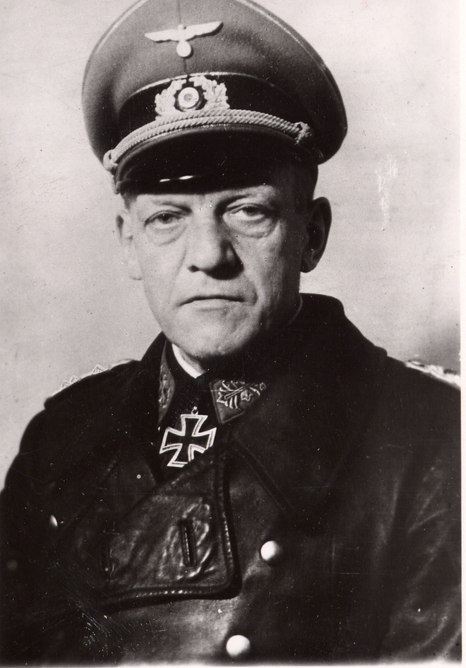 In 1933 he was promoted again and in the rank of “Oberst” was posted to command the war academy in Hannover. On the 20th of April 1936 Lindemann was promoted to Generalmajor and got command of the new 36. Infanterie-Division in Kaiserslautern. On 1st of April 1938 he was promoted to the rank of Generalleutnant. 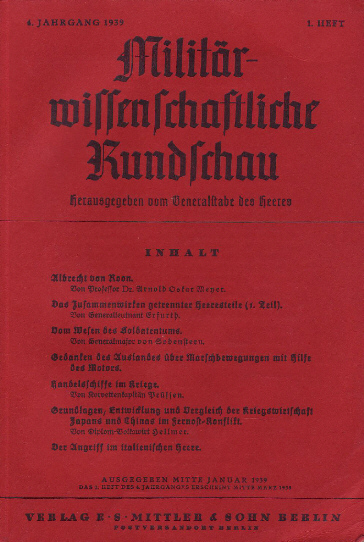 In these years Lindemann engaged in literary pursuits and in 1936 his first article was published in the “Militärwissenschaftliche Runschau” (Journal of military science). It was titled: “The state-conserving power of german military tradition“. In it he argued that only steadfastness and ethos of its officers could save a country from certain disintegration in times of crisis, drawing examples for his thesis from the Seven Years War (1756-1763) and the prussian defeat of 1806/1807. He wrote that the german officer class had tried to do the same in the years from 1918 to 1923, but that their sacrifices had been in vain and went without appreciation. He quoted from Hitlers “Mein Kampf” and looking back at the “November Revolution” he wrote about the “menacing ghost of Bolshevism and its immeasurable consequences for our culture“. In another article he advocated the concept of mobile warfare. He argued that on the modern field of battle, motorized units would be met by the motorized units of the enemy and because of that would bring no innovation to operative warfare. With the advancement of armour-piercing weapons, tanks would not be able to operate independently. He pleaded in favour of using tanks in the support of the infantry and to use them on a tactical level only as he could not envisage them working in large formations on an operative basis. This attitude was met with emphatic refusal by Generalmajor Heinz Guderian, commander of 2. 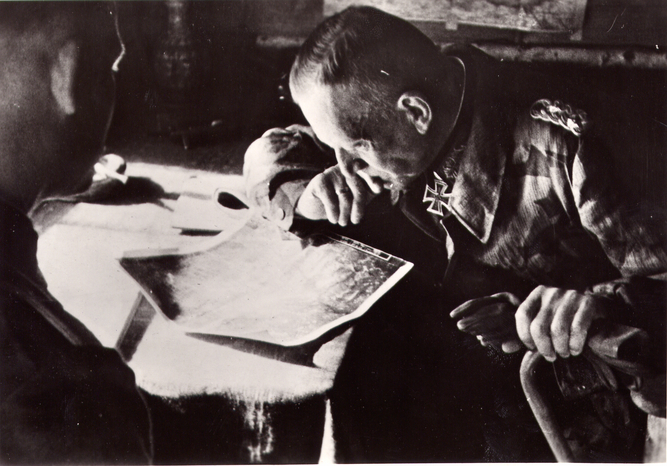 Panzerdivision and “Father of the german tank force” and the same year Guderian wrote an answer to Lindemanns article (“Der Panzerangriff in Bewegung und Feuer”), which was published in the “Zeitschrift des Reichsverbandes Deutscher Offiziere” in 1937. With the outbreak of World War Two 36. Infanterie-Division was mobilized, put under command of 1. Armee under Generaloberst Erwin von Witzleben and moved to the western border (near Mörsbach). It was the period of the “Sitzkrieg” (play on the word “Blitzkrieg“) known in England as the “Phoney War“. When the Campaign in the West started in the 10th of May 1940, Lindemanns Division was subordinated to VII. 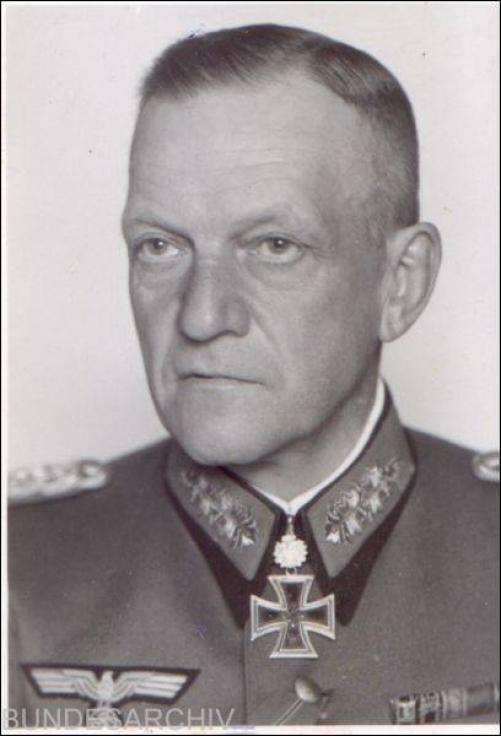 Armeekorps (General Eugen von Schobert), which in turn was subordinated to Armeeoberkommando 16 (Generaloberst Ernst Busch). Schobert and Busch had the same seniority and were both slightly younger than Lindemann. 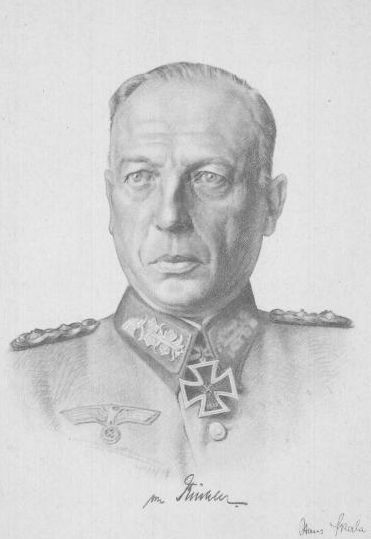 The historian Johannes Hürter wrote that “Georg Lindemann was still only commanding a division and still junior to his younger comrades Busch and Reichenau“. On the 14th of June 1940 Lindemanns Division took part in the break through the Maginot-Line. For his leadership Lindemann was awarded the Knights-Cross on the 5th of August 1940. On the 1st of October 1940 Lindemann was made General of the newly formed L. Armeekorps and a month later was promoted to the rank of General der Kavallerie (General of Cavalry). L. Armeekorps was transfered to Bulgaria in Spring 1941 and took part in the Campaign on the Balkans from the 6th to 23rd of April. 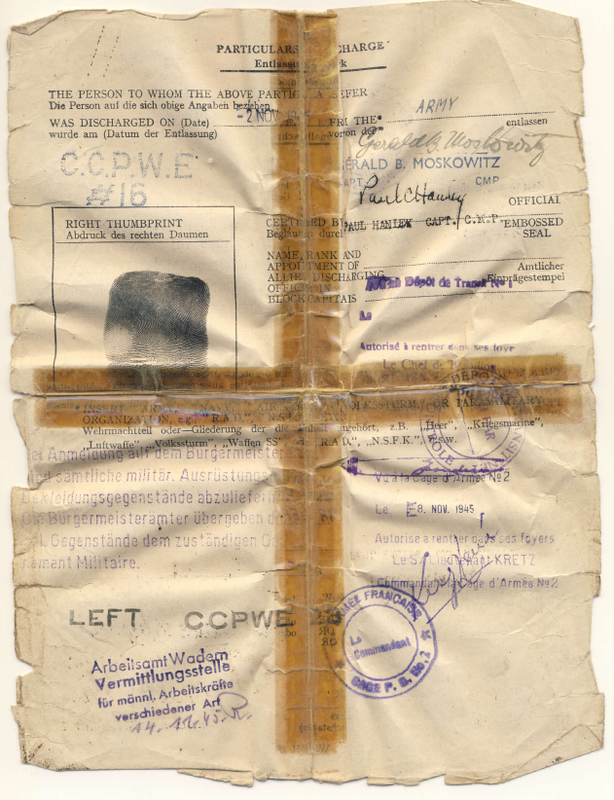 Lindemanns Korps was kept as Army reserve and did not see any action. Following the campaign Lindemanns command was shifted to Eastern Prussia into the controll of Heeresgruppe Nord (Army Group North) under Generalfeldmarschall Ritter von Leeb, to take part in the attack on Soviet Russia. Lindemann had not been involved into the immediate preperations for the attack and only learned about it a couple of days before the 22nd of June 1941. L. Armeekorps was again put under command of 16. Armee, pressing forward on the Army Groups southern flank into the direction Welikije Luki. On the 28th of July 1941 Lindemanns Korps was subordinated to 9. Armee of Heeresgruppe Mitte (Army Group Centre) for a short period of time. On the 2nd of August, during heavy fighting south-west of Welikije Luki and after running out of ammunition, 251. Infanterie-Division (of L. Armeekorps) suffered massive losses and had to be taken back behind the river Lowat. 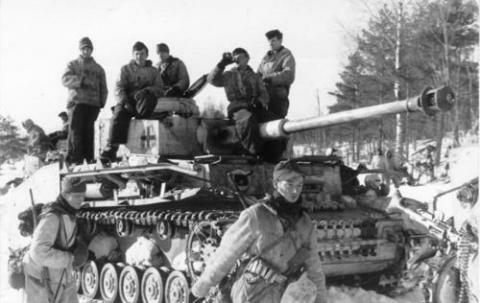 Under command of Panzergruppen-Kommando 4 Lindemanns Armeekorps took part in the push on Leningrad in September 1941. When Panzergruppe 4 was pulled out to take part in the planned offensive against Moscow in the second half of September, Lindemanns Korps was left behind to uphold the blockade of Leningrad in the area south of Pushkino. It was subordinated to 18. Armee under Generaloberst Georg von Küchler who knew Lindemann since 1914. In the Winter 1941/42, during the defensive battles at the Volkhov and south of the Ilmen Lake (Pocket of Demjansk) Heeresgruppe Nord experienced a crisis of leadership. On the 17th of January 1942 Generalfeldmarschall Ritter von Leeb applied for a discharge. On his behalf Generaloberst Küchler took command of the Army Group. As commander for 18. Armee Küchler chose Lindemann. Under Lindemanns command 18. Armee managed to encircle the 2nd Soviet Assault Army on the Volkhov and to destroy it by the end of June 1942. For this feat Lindemann was promoted to Generaloberst on the 5th of July 1942. In the following weeks parts of 11. Armee under Generalfeldmarschall Erich von Manstein were moved into the area controlled by Lindemanns troops. When the Soviets started their first offensive to liberate the city of Leningrad at the end of August 1942, Hitler ordered Manstein to organise and command the defences in the area of 18. Armee. 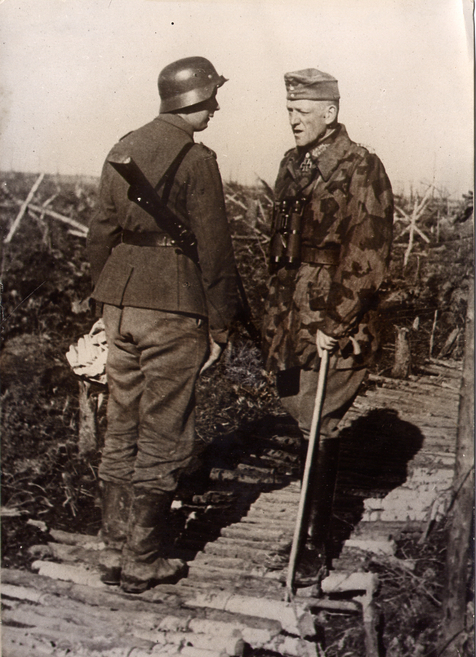 Manstein was embarrassed by the affront to Lindemann who he called “an old acquaintance from the Great War”. In Autumn 1942 AOK11 was pulled out again reinstating Lindemanns command in the blockade of Leningrad. In January 1943 Lindemann could not hold against the next soviet offensive to relieve Leningrad. The soviet Leningrad and Volkhov Fronts managed to break the ring around the city on the 18th of January 1943. When they tried to enlarge the small corridor they had gained in the fighting they were repelled by Lindemanns troops in Summer 1943 (Third Battle of Lake Ladoga). For this success he was awarded the Oakleaves to the Knights Cross on the 21st of August 1943. In the following months Generalfeldmarschall von Küchler asked for permission to fall back into new defensive positions further west. When Hitler asked for Lindemanns opinion he was certain that he would be able to repel yet another soviet offensive of the Red Army. Maybe he was motivated by the award he just had received, but as a result of Lindemanns statement the Army Group was commanded to hold its old positions. In January 1944 18. Armee had no means to counter the next soviet offensive (Operation Leningrad-Novgorod). After his Army had been flanked it received the permission to fall back to the river Luga. When Generaloberst Walter Model took command of Heeresgruppe Nord on the 28th of January 1944 he managed to talk Hitler into another fighting retreat. This time the Army Group fell back into the so-called “Panther Stellung” (Panther Defences). On the 1st of March 1944 the soldiers of Heeresgruppe Nord “made front” there. The destruction of the Heeresgruppe had only just been avoided. When Model was put in command of Heeresgruppe Nordukraine, Lindemann took command of Heeresgruppe Nord. The situation was alarming. Lindemanns command was down to 30 Infantry-Divisions consisting of only 110.248 men, 30 tanks and 206 assault-guns. The superiority of the enemy was overwhelming (8:1). When the expected soviet summer offensive began the connection of Heeresgruppe Mitte (Army Group Centre) was broken. A corridor 40 kilometers wide was now separating both formations. Through it soviet units now pushed towards the Baltic Sea. Only the so-called “Fester Platz” (Fortress) of Polozk was still held. Lindemann pleaded to be allowed to leave the town to the enemy and to fall back on the River Düna. By giving the Baltic to the enemy the frontline would have been shortened freeing reserves for a counter offensive. Hitler turned him down. But not only that, he ordered Lindemann to hold Polozk at all costs and to organise an offensive. Lindemann now asked to be discharged, which was rejected aswell. For his “offensive” Lindeman had two Divisions with only eight (!) full batallions and 44 assault-guns. With this force he was supposed to break through two full strength soviet armies up to a depth of 60 kilometers. the 2nd of July it met with no success and at the same time the soviet 4th Army managed to achieve a breakthrough south of Polozk. Lindemann was about to be encircled and now ordered a general retreat on his own authority, which was granted by Hitler soon afterwards. 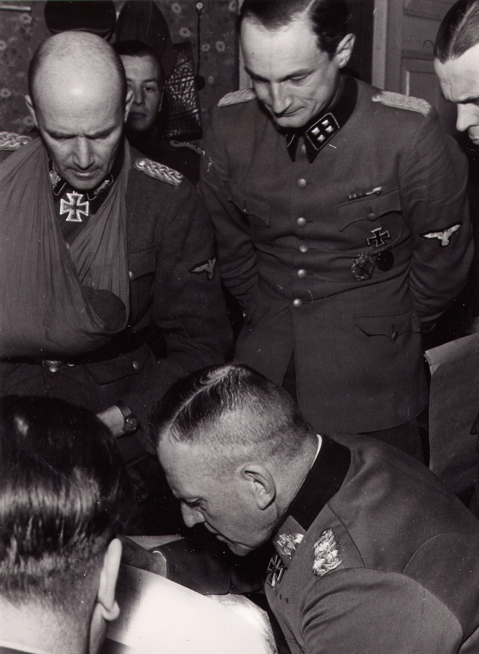 Shortly afterwards Lindemann was relieved of his command. His action had saved the Army Group from certain destruction. On the 4th of July 1944 General Johaness Friessner took command of Heeresgruppe Nord. Lindemann was now part of the leadership reserves. 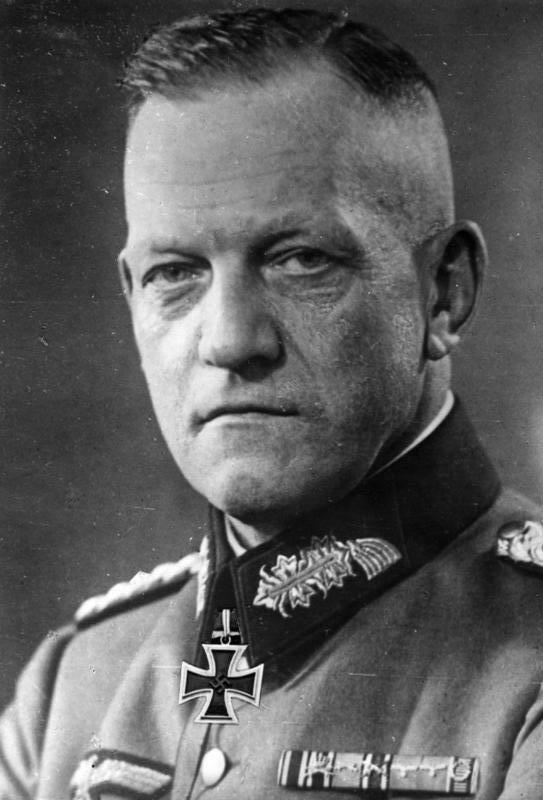 On the 27th of January 1945 he was put in command of the Wehrmacht forces in Denmark (“Wehrmachtsbefehlshaber Dänemark“), where he was tasked to mobilise resources needed for the “Endkampf” (Final Battle). The largest part of german troops in Denmark had already been transferred to the Eastern Front so that in a case of emergency not even a city like Copenhagen could have been defended with success. Because of this Lindemann concentrated on erecting blocking-positions on the Great and Little Belt. 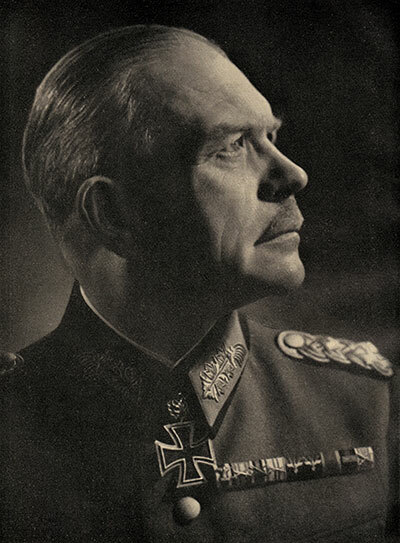 When the end of the war loomed on the horizon, Lindemann telegraphed a message to Hitlers successor Großadmiral Karl Dönitz, in which he highlighted the hopelessness of a defence of Denmark. 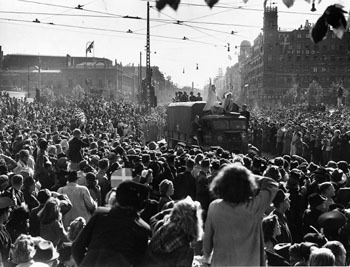 On the 4th of May 1945 german forces in Denmark capitulated. The civilian administrator of Denmark, Werner Best, had put himself under the protection of the Danish Liberty movement. Lindemann himself though wanted to continue the fight. He reported to Dönitz that he had 230.000 men at his disposal and that he would have Best executed as a traitor. 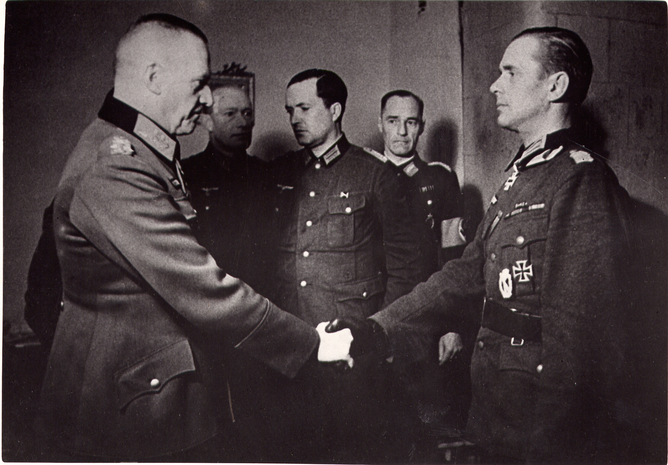 Dönitz ordered Lindemann to take Best prisoner and to cooperate with the British forces. Field Marshall Montgomery demanded the retreat of all german troops in Denmark. Only fugitives, the wounded and sick and foreign volunteers were allowed to stay. 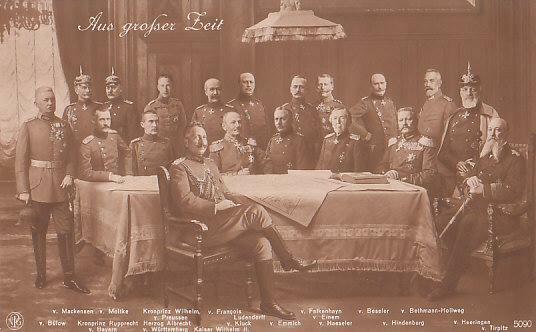 All german formations were grouped into the so-called “Armeegruppe Lindemann” and put under command of the “Oberbefehlshaber Nordwest” Generaloberst Ernst Busch. The return of the german troops was organized and coordinated by Lindemann and the british General Richard Dewing. After the repatriation of his units Lindemann stayed free until being arrested by US Troops on the 4th of June 1945. He was released from captivity in 1947. During this time he acted as witness during the Nuremberg trials. On the 26th of September he was again arrested and extradited to Denmark to be put on trial there. The trial never came and he was released on the 15th of May 1948. He moved to Freudenstadt where he lived a quiet life up until his death in 1963. According to his own testimony he refrained from passing on the so-called “Kommisarbefehl” (Commissary Order) to the troops under his command. In Nuremberg he claimed that “An order is an order, but we older commanders took the liberty to choose which order was to be obeyed and which was to be ignored”. He had a similar attitude to the “Kriegsgerichtsbarkeitserlass” of the 13th of May 1941. This order removed Wehrmacht soldiers from the prosecution of the law when they committed a crime against the civilian population. As commander of 18. Armee he confirmed death penalities against german soldiers. In one case an army clerk had killed a russian girl. In another case a german soldier had killed a russian man because he tried to keep the soldier from dating his sister. The historian Charles Whiting describes Lindemann as a “fervent Nazi”. Personally I think he his wrong. 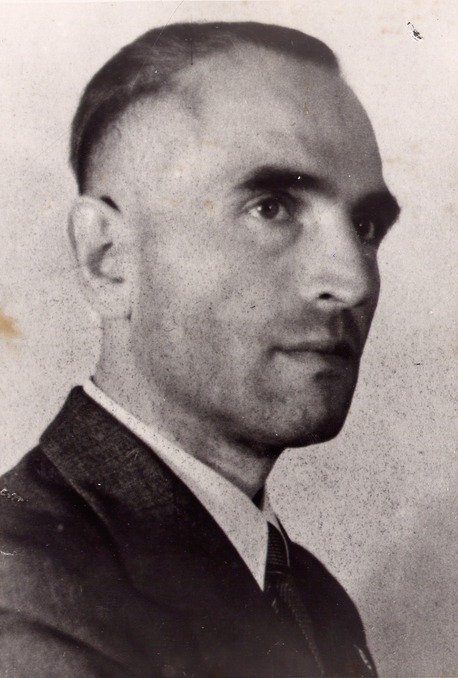 In Summer 1942 Lindemann had a personal conflict with the “Reichssicherheitshauptamt” of the SS, because he complained against the shootings of prisoners by the 2. SS-Infanterie-Brigade. Richard Brett-Smith: Hitler’s Generals. Osprey Publishing, London 1976, ISBN 0-850-45073-X. Karl-Heinz Frieser (Hrsg. 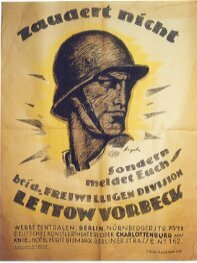 ): Die Ostfront 1943/44 – Der Krieg im Osten und an den Nebenfronten. Deutsche Verlags-Anstalt, München 2007, ISBN 978-3-421-06235-2, S. 278–339 (= Das Deutsche Reich und der Zweite Weltkrieg. Bd. 8). Johannes Hürter: Hitlers Heerführer – Die deutschen Oberbefehlshaber im Krieg gegen die Sowjetunion 1941/42. 2. Auflage. R. Oldenbourg Verlag, München 2006, ISBN 978-3-486-58341-0 (=Quellen und Darstellungen zur Zeitgeschichte. Bd. 66). Georg Lindemann: Die staatserhaltende Kraft des deutschen Soldatentums. In: Militärwissenschaftliche Rundschau. Nr. 1, 1936, S. 291–308. Georg Lindemann: Feuer und Bewegung im Landkrieg der Gegenwart. In: Militärwissenschaftliche Rundschau. Nr. 2, 1937, S. 362–377. Samuel W. Mitcham, Gene Mueller: Hitler’s Commanders. Scarborough House, London 1992, ISBN 0-812-84014-3. John Zimmermann: Die deutsche militärische Kriegführung im Westen 1944/45. In: Rolf-Dieter Müller (Hrsg. ): Der Zusammenbruch des Deutschen Reiches 1945 und die Folgen des Zweiten Weltkrieges. München 2008, ISBN 3-421-06237-4, S. 277-489 (= Das Deutsche Reich und der Zweite Weltkrieg. Bd. 10/1). One of the best things about running this blog and the connected twitter account is that they bring me in touch with good and interesting people all over world. One such accquaintance is Thorsten Herbes, a german compatriot living in the USA. He has written a story about his grandfathers experiences in WW2 and not only did he do a wonderful job with the research, its also obvious how much he misses his grandfather (german: Opa). I am honored and very happy that he allowed me to share this story and I am sure you will find it as excellent as I did. 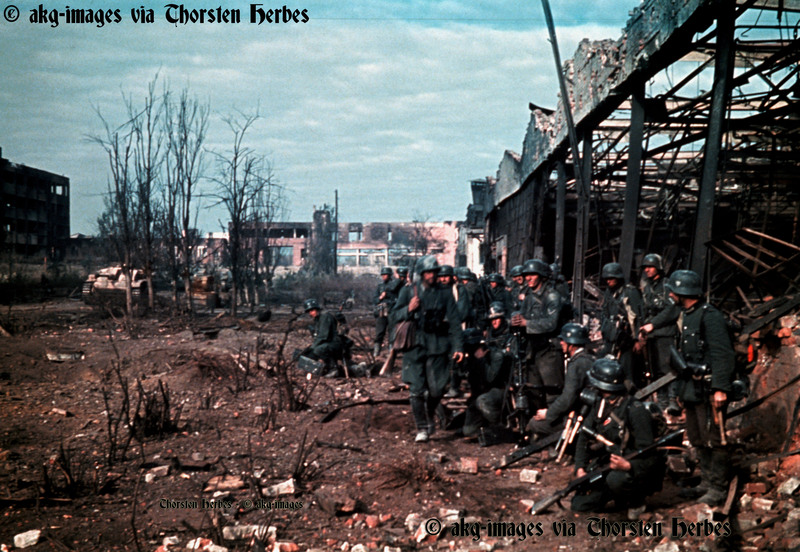 Scarce and impressive 35mm color slide showing Herr Herbigs grandfather (5th from the right) and members of his platoon (Infanterie-Regiment 545) in Stalingrad. Taken in the vicinity of the Tractor Factory “Red October”. In the background you can see a couple of Assault Guns (StuG III – Probably of Sturmgeschütz Abt. 177, 243, 244 or 245). The detail and atmosphere of this photo is breathakingly good. Thorstens Grandfather served with Infanterie-Regiment 545 in Stalingrad and was one of the few who got out, being evacuated via Gumrak inside a Heinkel He-111. I do not want to imagine what he must have experienced there. The name of Gumrak alone sends shivers down my spine, but this may be part of a later story. Time for Thomas and his Opa (Grandfather) to take over. For as long as I can remember, I have been fascinated by the Second World War. When I was old enough to realize that he had been a participant, I began to beg my grandfather to tell me stories about the war, often to the dismay of the rest of the family, who’d grown tired of hearing them. I was mesmerized by his descriptions of Russia and awestruck when he showed me his surviving pieces of equipment. Never before had history felt so real, so touchable. I remember playing with his bayonet and searching every drawer in his house, hoping to find another hidden treasure. As I got older, I began to look at history from a larger perspective, learning about the cause of war, the strategy and the equipment. I built a small library of books and devoured them at every opportunity. I visited every military museum I could find and often dragged many an unwilling participant along with me. Although my fascination with the technology and tactics of war never faded, an additional question began to form in my head – how did the experience of war affect a human being? What did the veterans experience on a personal level and how did it influence my grandfather? When I left Germany in 1992 to move to the United States, I lost the ability to visit Opa and Oma as often as I’d been used to and our conversations and meetings became more infrequent and precious. The more time passed, the more I realized that we were losing members of the World War II generation daily and with them the personal connection to their past. I took every opportunity I could to preserve Opa’s history, taping conversations and taking notes. During a trip to Germany in the fall of 2008, sitting at his kitchen table, listening to his stories, I realized that the end of Opa’s military experience occurred during the Battle of the Bulge in Luxembourg, no more that 2 hours’ drive away from his home – but that he’d never been back after the war. The following day, my wife and I drove to Luxembourg to explore some of the sites Opa had mentioned and to take some pictures for him. We found villages like Bastendorf and Diekirch, where my wife convinced me to stop at the military museum. At first I didn’t want to make her spend a day of our honeymoon looking at tanks, but she was insistent. The museum was amazing and brought back that feeling I had as a kid, when history was real and touchable. I wondered if any of the thousands of artifacts belonged to Opa and was almost expecting to see his picture hanging on the wall at every turn. It was at the museum where we met Roland Gaul and the idea for this project began to take shape in my head. Roland Gaul then gave us directions to Mertzig and asked to stay in touch. We returned home at the end of the day, exhausted – but with a memory card full of images. Almost immediately, Opa started recognizing places and memories returned to him. “I remember it as if it were yesterday,” he’d say, almost incredulous. I could almost sense a curiosity in him, a desire to reconnect – but accompanied by fear. After returning home to Chicago, I continued to research Opa’s story, resulting in the following document. 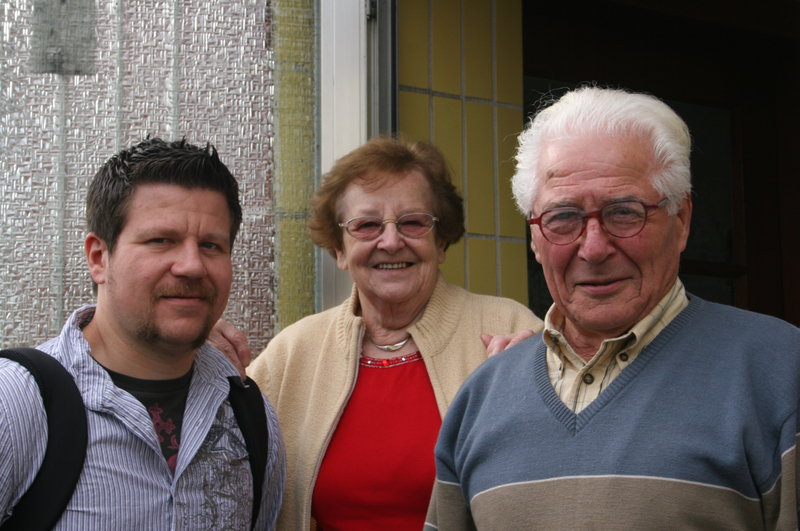 Although initially just a hobby research project, it grew into something larger than I could have ever imagined or intended, involving many kind people and culminating with Opa’s visit to Mertzig on December 22nd of 2008 – the first time he’d faced his war in over 64 years. He was reluctant to go, seemingly plagued by demons from the past. He returned, hours later, much more at peace than I’d ever seen. This is his story. The phone call I’d been dreading came in May of 2011. It was late in the day here and calls from Germany at that hour were unusual. It was my father, telling me that my grandfather had beendiagnosed with terminal cancer. Less than three months later, we buried him. Looking back at his life, he would appear to be a simple man at first. He lived in a small town in the Saarland region of Germany, worked as a Handwerker in construction and painting houses, fathered four children, loved to hunt and fish and passed peacefully, after a long life. Underneath, however, was a man deeply influenced by his experiences as an infantry soldier in World War II. 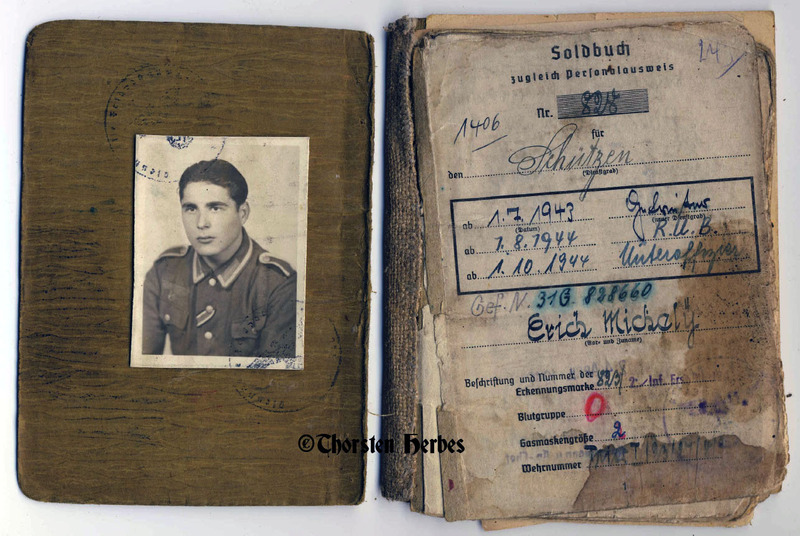 Born in 1923, he was still in his teens when he was drafted into the Wehrmacht. By the time he was 20, he had survived Stalingrad, the Wehrmacht’s biggest defeat thus far. After recovering from his wounds,he was sent back to the Eastern front, this time to Cherkassy, where he was soon wounded again. The final chapter of “his” war played out in the west, in December of 1944. I had always been interested in his experiences in the war and only as I got older did I begin tounderstand truly how deeply it had affected his psyche and how profoundly long lasting its effects were on him. After researching the following story and having him talk about his experiences again, he developed nightmares again, so realistic that it felt to him as if the events had happened yesterday. I put Opa’s story on paper mainly for my family, so that we wouldn’t lose the connection with history after he passed away. I wish I had started sooner and perhaps got him to tell me more about his experience in Russia, but I was too late. It is with some trepidation that I decided to share it with others through Rob’s blog (1infanteriedivision.wordpress.com), but I can’t think of a better way to honor a great man. There is not a day that goes by where I don’t think about how much I miss him. 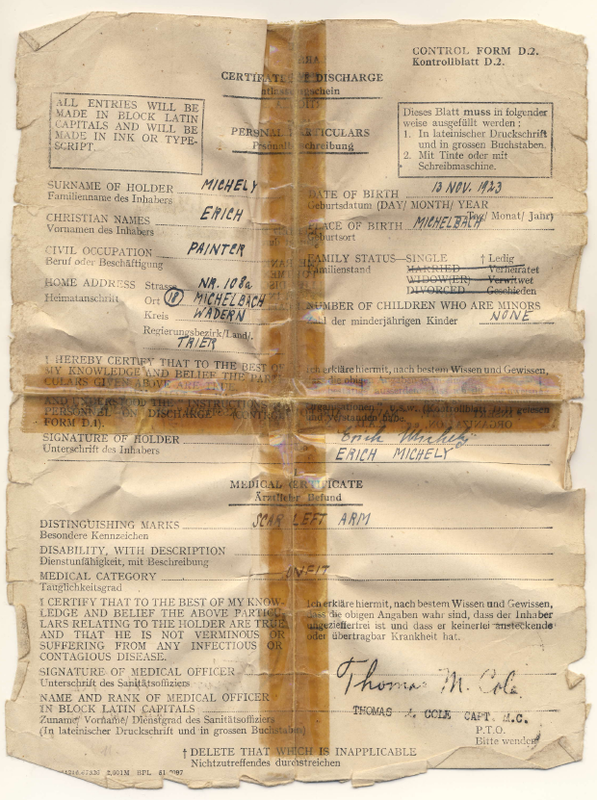 Copy of POW Notice, received by Michely’s parents in 1945. By December of 1944, after five long years of war, the Allied Forces had landed in Normandy, successfully broken out, advanced across France and approached the Western borders of Germany. Hitler’s Reich was being squeezed on two fronts and the Allies were preparing for their final assault into Germany. In a desperate attempt to drive the Allies back, Hitler devised a last-ditch effort to drive back the Allies, code-named Operation Herbstnebel (Autumn Mist). Under strict secrecy and radio silence, the Germans assembled two Panzer and two Infantry Armies as part of Army Group B in order to drive a wedge between the British-Canadian forces in the North and US forces in the South while capturing the important supply port of Antwerp, Belgium, after crossing the Meuse River. Recapturing the port (which had only been opened by the Allies on 28 November) would deal a decisive blow to the Allied supply lines and ability to wage offensive operations against Germany. Much of the history of what was to become “The Battle of the Bulge” concerns itself with the Northern flank of the German attack and Joachim Peiper’s attack on Bastogne, courageously defended by the 101st Airborne. The aim of this document is to explore the Southern flank of the German attack in the context of the personal experiences of Erich Michely, a member of the 8th Company, 2nd Battalion, 915th Regiment, 352nd Volksgrenadier Division – grandfather of the author. Nestled between Belgium to the North and West, France to the South and Germany to the East, lays the Grand Duchy of Luxembourg. Founded in 963, it occupies an area slightly smaller than Rhode Island and had a population of approximately 293,000 in 1945. Luxembourg’s terrain consists of heavily wooded rolling hills with farm land and villages. By December 1944, Luxembourg had been liberated by the Allies after suffering from German occupation since 1940. Although the war continued to the east, life in the country was slowly returning to normal. No one suspected that the Wehrmacht would last much longer and the end of the war seemed imminent. By winter of 1944, Luxembourg had become a rest area for weary frontline GI’s as well as a quiet area in which to acclimate newly arrived replacements to the front. The war had become mostly static, with the Siegfried Line on Germany’s western border as the front. 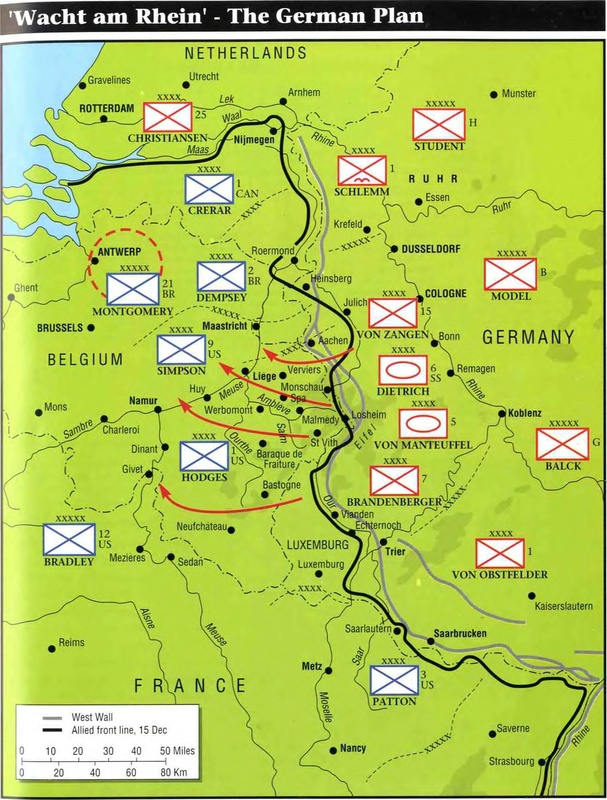 To the north, Field Marshal Montgomery’s troops were preparing for their eventual drive into Germany’s industrial heartland while, to the south, General Patton’s Third Army was also attempting to cross the Rhine into Germany. Headquartered in Bastogne, the US VIII Corps was responsible for the section of the line extending from southern Belgium to the southern end of Luxembourg. This sector was generally seen as a quiet front, used to recuperate units exhausted from the Huertgen Forest campaign earlier. When Wehrmacht troops crossed the Our on 16 December, VIII Corps consisted of the 9th Armored Division, 11th Armored Division, 17th Airborne Division, 28th Infantry Division and the 87th Infantry Division, along with several AAA and Engineer units. 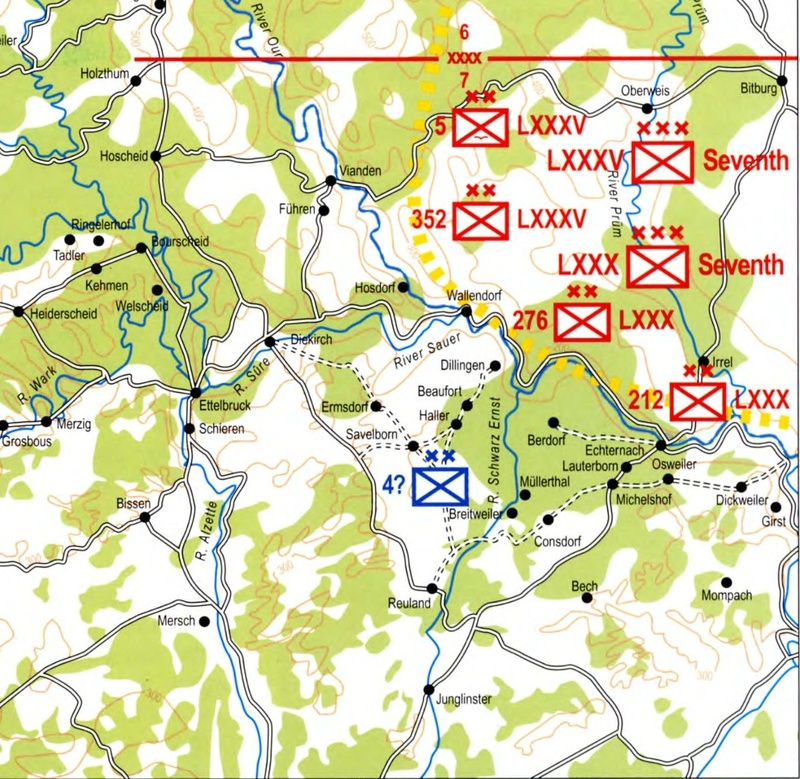 Opposing the German’s 352nd VGD was the 28th Infantry Division, stretched along a 27 mile line from St. Vith in the north to Vianden in the south, with the 112th Regiment on the left (northern) flank, the 110th in the center and the 109th Regiment on the southern flank. Under the command of Field Marshall Model, German Army Group B was comprised of the 15th Army, 5th and 6th Panzer Armies as well as the 7th Army. 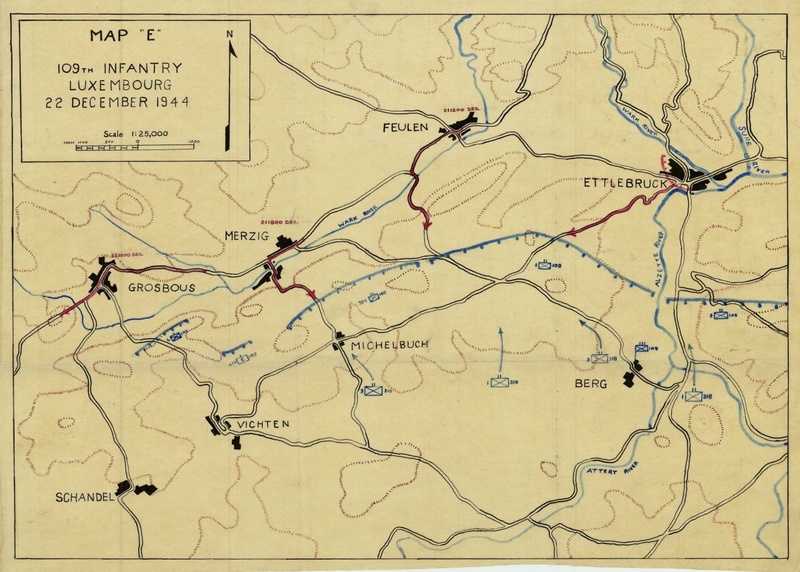 Tasked with conducting the attack, Army Group B covered a front from northern Belgium to southern Luxembourg, with 7th Army, under the command of General Erich Brandenberger responsible for the southern thrust into Luxembourg and toward the river Meuse. Its main objective was not only to reach the Meuse but also protect the operation’s southern flank while tying up Allied reserve forces in Luxembourg. Although 7th Army contained several units (4 total divisions – 3 Volksgrenadier and 1 Fallschirmjäger), the focus of this document will remain with the 352nd VGD, of which Michely’s 915th Regiment was a part. The 352nd Volksgrenadier Division was formed on 21 September 1944 in Flensburg, Germany out of remnants of the 352nd Infantry Division, which was almost completely annihilated in July of 1944 during defensive operations in Normandy, France. Units of the 352nd Infantry Division were augmented by the 581st Volksgrenadier Division, which was being formed as part of the 32nd wave. The division consisted of navy and air force troops, veterans of the 352nd as well as veteran NCO’s from the Eastern front (such as Michely). Most of the NCO cadre was made up from remnants of the 389th Division, which was destroyed on the Eastern Front at Cherkassy (where Michely was wounded). The 389th also participated in the battle for Stalingrad during the winter of 1942 -1943 (of which Michely was also a part). By the time it was declared fit for combat, the352nd Volksgrenadier Division consisted of approximately 13,000 men, reflecting 98% of specified strength. Enlisted Personnel: Age 23 -30, not enough training, no land or combat experience, not seen action. Full strength. Non-commissioned Officers: Mostly navy troops, most lack front experience. 75% strength. Officers: Varied front experience. Full strength. Infantry: Good fighting spirit in Regiments 914 and 915. Lacks training and front experience. Equipment: Mostly complete. Missing 35% of radios for fire direction, 30% of assault guns, 25% assault rifles. In general terms, the 352nd VGD was well equipped for 1944 but lacked in experience. 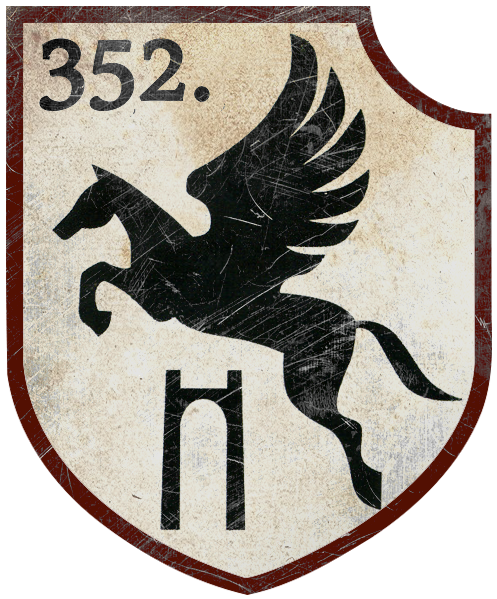 The 352nd was made up of three infantry regiments (914th, 915th and 916th), an artillery regiment, one cavalry battalion, one anti-tank battalion as well as anti-aircraft, engineer and signal battalions. At full strength, the division made up about 13,000 troops. 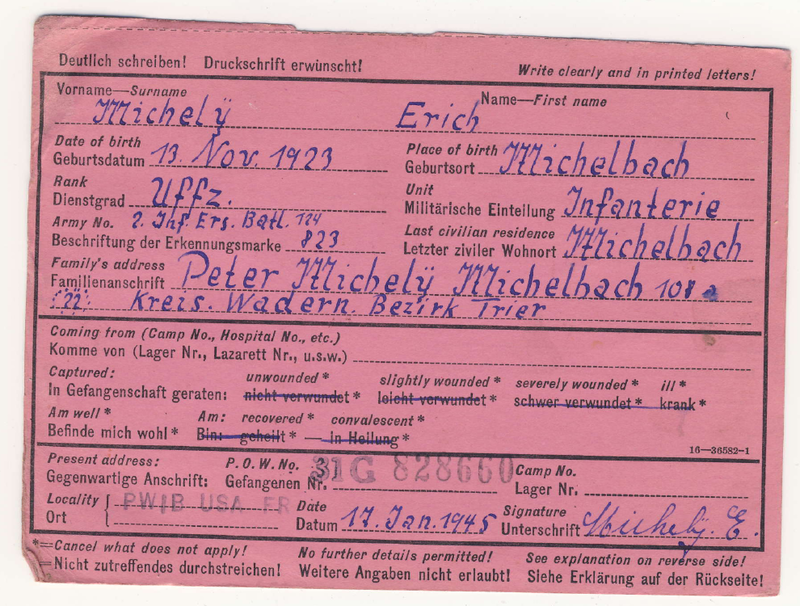 Unteroffizier Erich Michely, veteran of two tours of duty on the Eastern Front, was assigned to 8th (Heavy) Company, 2nd Battalion, 915th Volksgrenadier Regiment, as a light infantry gun crew leader. After being wounded near Cherkassy, Russia, in March of 1944, Michely was transferred to a hospital in Lebach, Germany, near his home. After months of recovery and a brief period of leave, Michely received orders to report to the 915th Volksgrenadier Regiment near the town of Flensburg in northern Germany. It was during exercises in Flensburg that Michely was trained on using the 75mm infantry gun he would later lead during the Ardennes Offensive. The 75 mm guns were of a brand new variety, likely the 7.5 cm leichtes Infanterie Geschütz 42. These guns were not mechanized, but drawn by horses and were meant to be used as both light artillery as well as anti-tank weapons. Each gun had a team of 4 horses and a crew of 7. “The names of the men on my crew were Otto, Kirnbauer, Abendrot and Kraft. I don’t recall the rest of them.” As a gun crew leader, Unteroffizier Michely was responsible for directing the gun’s fire and the welfare of his men and horses. “After recovering from the gut shot wound at Cherkassy, I was able to convince the doctors that I was no longer suited for service as an infantry soldier, as I had been in Russia. Personally, I simply didn’t think I’d survive another turn as an infantry man.” He was given special training and binoculars to locate targets and estimate range. Leading an artillery gun was an entirely new trade for Michely, who had been a machine gunner in an infantry unit during his time in Russia. 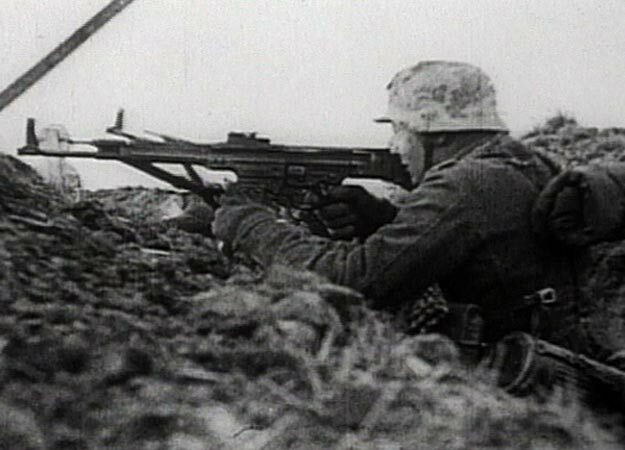 For the first time he was also issued with the Wehrmacht’s new assault rifle, the MP44. “Our regiment was spread out over several villages near Flensburg and we had little interaction with the other companies. I only knew the men in my crew as well as the other gun crew leaders, with whom I shared briefings. When we finished training in November, we assembled on some sort of parade ground and were loaded on trains and began to head east. I wasn’t excited about the prospect of heading back to Russia and didn’t think I would make it home alive from a third tour”, recalled Michely. “We had made it to Poland but, sometime during the night, we must have changed direction. I was sleeping and didn’t notice the change until one of the men screamed ‘Mannheim, we’re in Mannheim!’ I asked him if he’d lost his marbles before we’d even reached the front, but he insisted that we were indeed in western Germany since he was from the area. Much to my surprise, he turned out to be correct.” The train continued to the southwest, at one point even coming close to Michely’s home town. “I asked the chief if I could go and visit my family for a few hours. He laughed and said ‘Michel, if I let you go, you’ll never come back.’”  The train continued its journey to the West, along a route taking the men through the ancient city of Trier to Bitburg until finally disembarking at Densborn, a mere 35 kilometers from the Our river. Although the average soldier in Michely’s unit appeared to have little clue as to their mission, signs were beginning to point to something big. “There were several occurrences, prior to the Division being informed of the planned offensive, which pointed to an impending large-scale combat action – but it was unclear who would be conducting the attack”, recalls Schmidt. “It was seemingly a miracle to all those involved that the Americans did not discover the offensive.” Schmidt himself was informed of the attack in early December. The division was now tasked with several preparatory actions for the offensive, including the transport and delivery of all ammunition and bridge building materials inside the 5 kilometer restricted area within its assigned sector. This task was to be conducted at night and by means of horses. Additionally, pathways were marked for troop movements, artillery positions prepared and supplies were deposited and camouflaged, intended for the first wave of attack. The troops themselves weren’t told of their mission until 6 hours before the attack was to begin. The 915th regiment was to cross the river Our near Gentingen, the 916th near Ammeldingen and the 914th was to be in reserve. On the opposite bank of the Our, American GI’s were dazed by the opening barrage but quickly began to organize a defense. Captain Embert Fossum, in charge of L Company, 109th Infantry Regiment, 28th US Division, was positioned directly across the river from the 916th VGR. Years later, Fossum recalled: “Company L, 109th Infantry, was the southernmost unit of the 28th Division when the German attack hit. Although the front was too wide to be adequately defended – approximately two miles – the ground it occupied was admirably adaptable for a defensive situation…During the [German’s] initial artillery preparation, which aroused the company at 0600 HRS on the 16th, the house where L company’s command post was located received a direct hit from both conventional artillery and Nebelwerfer rockets, which set it afire.”  At dawn, the first waves of German infantry began assaulting L Company’s foxholes on the western shore of the river, but were unsuccessful in dislodging the Americans. Following its orders to bypass enemy strong points, advance units of the 915th crossed the Our by means of rafts, rubber boats, floats and footbridges. The troops moved quickly and by nightfall had reached a wooded area near Bastendorf. Historian Bruce Quarrie describes the 915th’s move: “Screened by the mist which aided all of Seventh Armee’s assault companies, the leading two battalions fortuitously struck at the junction between the US 109th Regiment’s 2nd Battalion, whose Company E was in Fuhren, and the 3rd Battalion’s Company I deployed in front of Bettendorf. There was a 2,000-yard gap in between the American positions which the Volksgrenadiers exploited, advancing unopposed through Longsdorf and Tandel.” The town of Bastendorf, as well as Longsdorf and Tandel remained in enemy hands. When asked about his role during the first few hours of the offensive, Michely struggles to remember specifics, but it is unlikely that his company was part of the first wave across the Our. At Gentingen, the 352nd Engineer Battalion was working feverishly on completing a makeshift bridge across the river, capable of transporting the division’s heavy weapons, artillery and supplies. By the next morning, the 915th still remained strung out, with its advance elements near Bastendorf and its heavy weapons, including Michely’s company, still awaiting the completion of the makeshift bridge across the Our. The regiment also suffered its first setback, losing its regimental commander, OberstLeutnant Johannes Drawe to a wound near Tandel. According to his personal diary, Drawe recalls: ”Sunday, 12/16/1944: 0430 HRS: went on duty. 0530: Began to fire. 0900; Personally crossed over and went on to Longsdorf. In Longsdorf 1300, command post set up. During the day directed following units; artillery commander and VB had no radio contact with firing batteries until 1800…Sunday, 12/17/1944: No supplies, no reports; 916 also in town. Constant medium-caliber harassing fire. Reconnaissance fails. 0730 commenced to move command post to Tandel. 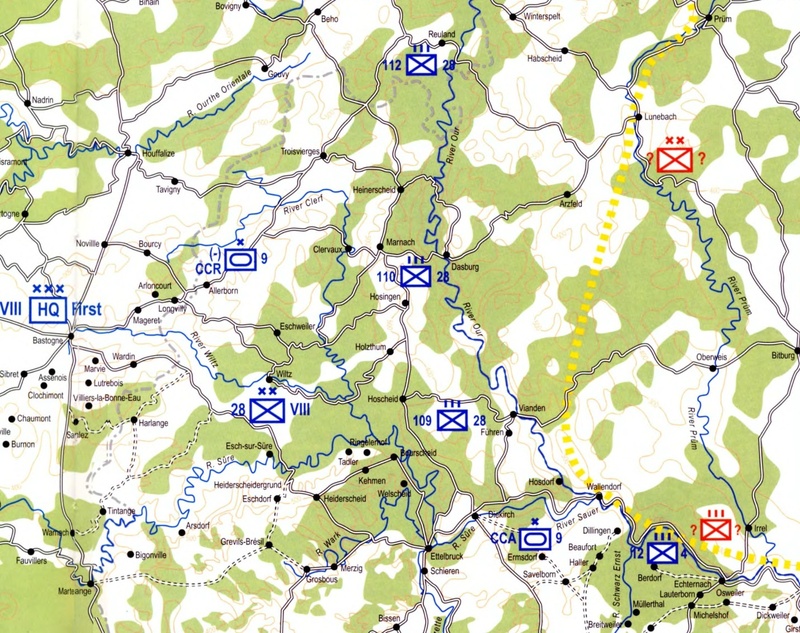 0830: fighting in Tandel. Around 0900 wounded.” The regiment now also faced stiffening resistance and was unable to clear Bastendorf, portions of Tandel and Longsdorf until later in the day, when it was taken by the division’s reserve regiment, the 914th. By evening, engineers finally completed the bridge at Gentingen and heavy weapons and vehicles were allowed to cross. Although he does not recall, it is likely that Michely’s unit was among those to use the bridge at this time. Meanwhile, units of the 109th Infantry continued to resist the attack, but were beginning to feel the effect of their losses. “…with an abundance of artillery support, L Company managed to beat back every attack [but] all of this was not done without considerable loss, both killed and wounded. And on the 17th all available manpower, including the company’s kitchen personnel, was brought up and put in the line.” Reinforced in this manner, Company L continued to hold its position along the heights overlooking the Our, determined to slow the progress of the 916th and direct artillery fire on the river crossings. Elsewhere, the remainder of the 109th Regiment was engaged in firefights all along its sector, stalling the attack but sustaining heavy losses. Entering the third day, the German attack was beginning to gain ground and force the American 109th to fall back. 1st and 3rd Battalion (Companies A and K) linked up and organized along the high ground south of Longsdorf, where K Company continued to face heavy attacks, resulting in the loss of an entire platoon to captivity. Company A, supported by one platoon of armor, attempted to fight its way into Fuhren to relieve Company E, 2nd Battalion, only to find the town empty and void of friendly troops and the command post burned to the ground. Company L was facing similar setbacks. “Shortly after noon on the third day, 18 December, the company was ordered, via [radio] to fall back to Bettendorf, the location of 3rd Battalion headquarters. This was accomplished with considerable difficulty and some casualties, as a limited penetration in I Company’s sector to the north enabled the enemy to cover the road back with automatic weapons fire.” The company now took up defensive positions around Bettendorf, allowing the rest of the battalion to slip to the rear under cover of darkness to join the rest of the regiment in a newly selected defensive position on the high ground north and east of Diekirch. Throughout the night, L Company fell back to Diekirch as well, following the remainder of the battalion along the same route, one platoon at a time. The last group to leave Bettendorf assisted members of Company A, 103rd Engineer Combat Battalion to blow both bridges over the Sauer after crossing. The quest for a full stomach continues throughout Michely’s anecdotes. On another occasion, his men pulled into a small patch of woods to rest. Hungry and tired, Abendrot immediately began to fry up some of his eggs, while Michely and the rest of the men dug foxholes for themselves, in case of enemy artillery fire. “All of a sudden, incoming rounds started falling around us and I made a leap toward my foxhole – only to find it already occupied by Abendrot, who was also holding his pan of eggs. I had no choice but to climb in on top of him!” According to Michely, both men, and more importantly, their eggs, survived the barrage. Unaware of the American reinforcements, the mission of the 352nd VGD was now to take possession of the river crossings at Ettelbruck, having already captured Diekirch. Upon taking possession of Diekirch, the left flank of the German attacking units discovered its bridge only to be damaged, not destroyed, allowing both infantry and heavy weapons to cross. It was decided to take advantage of this situation and use the 916th to cross the river Sauer in an effort to attack the strongly defended town of Ettelbruck from behind. By now, realizing the dangerous nature of its unprotected left flank, the 28th US Division commander ordered the 109th Regiment to roll back with the 9th Armored. After pivoting to the south, the 109th had formed a line, generally facing north, at right angles to its original position, on the high ground south of Ettelbruck. 3rd Battalion’s task was to cover the left flank of this line and was broken into three units, which were to be positioned at major road junctions to the west of this line. 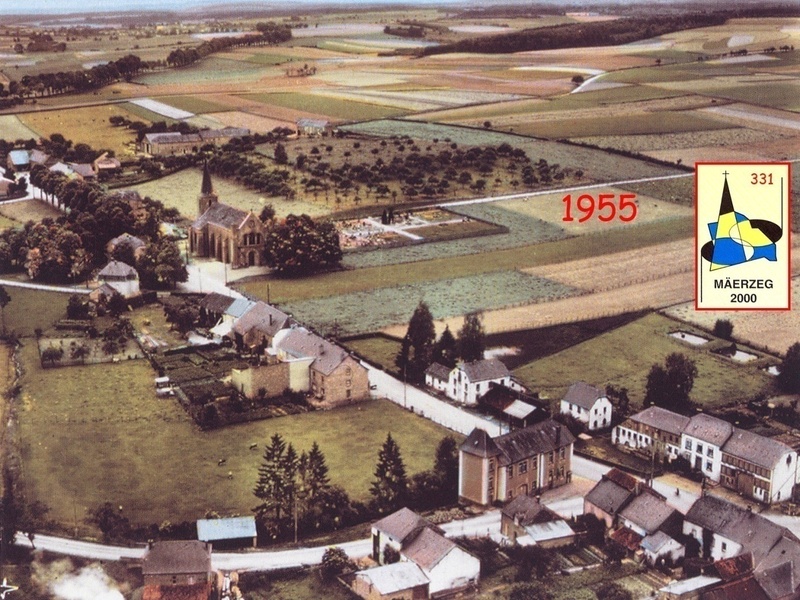 I Company was reinforced and moved to the village of Feulen. K Company, also reinforced, moved to Mertzig. Battalion headquarters was set up at Michelbuch. L Company was reinforced, renamed “Task Force L” and ordered to move 7 miles southwest and occupy the town of Grosbous. Bypassing Ettelbruck, advance units of the 915th began probing attacks on I Company’s positions near Feulen almost immediately, while the remainder of the regiment, along with Michely’s unit surrounded the town of Ettelbruck. Michely’s own position at this time is unclear but is likely on the high ground to the north of the town, as his platoon’s mission was to provide artillery support to the units attacking Ettelbruck. At around 1000 HRS, 1st Battalion, while fighting off several probing German attacks, managed to capture a German officer who carried an operational map outlining the mission of the 352nd and providing the Americans with valuable intelligence. Meanwhile, I Company continued to defend Feulen but was forced to withdraw, opening the road to Mertzig. The company retreated to the south-west, occupying the wooded heights running parallel to the road, tying in with 1st Battalion on the right and 3rd Battalion’s K Company on the left. Taking advantage of the open road, elements of the 915th, consisting of infantry and armor, pressed on against Mertzig and forced K Company to retreat to the south, astride the road to Michelbuch. At 2100 HRS, a scouting patrol from the 915th advanced as far as the outskirts of Grosbous, 2 miles west of Mertzig, where it was met by Task Force L and repulsed, resulting in 31 dead. By nightfall, the 915th was now firmly in control of Mertzig, but unable to take Grosbous. Its heavy weapons and trains remained behind, ready to join them the following morning. Continuing its move to the north, the US 80th Division now began to arrive in the area. 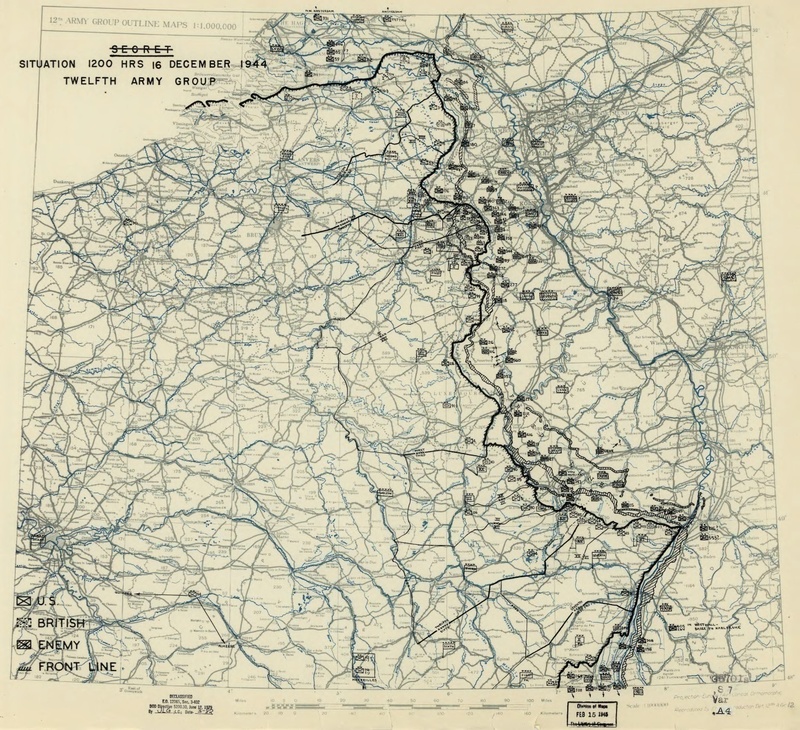 Lieutenant Colonel Elliot Heston, commanding officer of the 3rd Battalion, 319th Infantry reported: “On the morning of the 21st, the battalion received orders to move to Brouch, about 16 kilometers northwest of the city of Luxembourg. The high ground in the vicinity of Brouch and Buschdorf was occupied, with the battalion defending to the north. During the night of the 21st orders were received to attack to the north at dawn the next morning until contact was made with the enemy, which was expected to be in the vicinity of Mertzig.” The 319th would pass through the lines of Colonel Rudder’s 109th Regiment and relieve the tired troops. CT 319 moved by shuttle to its designated areas and cleared them at 1715 HRS, after which they posted local security and made preparations for the advance. The pieces were now in place for the American counterattack on the exposed left flank of the 915th Volksgrenadier Regiment. Rue de Michelbuch runs along the bottom of the image, while Rue Principale stretches from bottom-right to top-left. 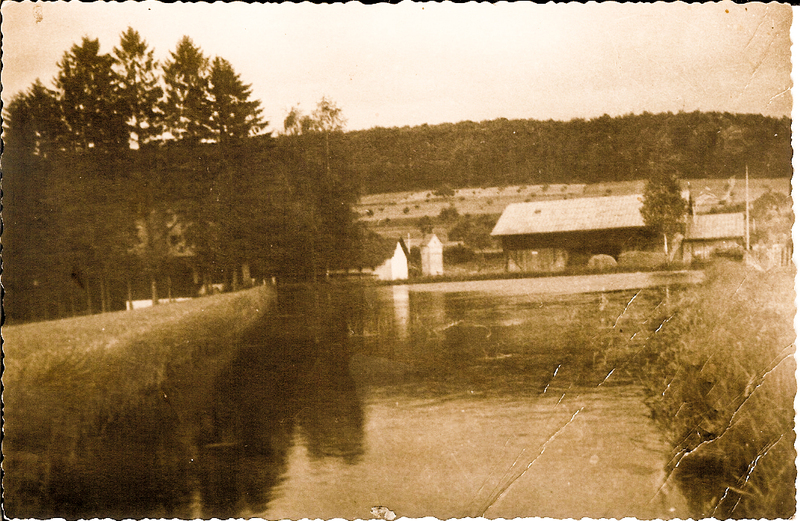 The first three building along the right side of Rue Prinicpale are Maison Weis, the machine house and the saw mill. Hotel Schammel is on the left side of Rue Principale, first house on bottom-right corner. The village of Mertzig stretches along its Rue Principale, in a slight south-westerly direction 2 miles west of Niederfeulen and 1.5 miles east of Grosbous, 15 miles north of Luxembourg City. The road runs along a valley, bordered by fields to the north and wooded hills and the River Wark to the south, set several hundred yards away. Several buildings, located in the very center of Mertzig in 1944, intersected by roads leading to the north (Rue de Merscheid) and south (Rue de Michelbuch) remain there today, with little change. By the evening of 21 December 1944, 1st and 3rd battalion of 915 VGR had pushed through Feulen, taken Mertzig after a brief fight with K Company, 3/109 and established a HKL, facing south and west. Scouting elements advanced as far as Grosbous but came under fire from Task Force L around 2100 HRS. Halting for the night, 915 VGR was now preparing to continue its offensive operations, with 1st and 3rd battalions moving toward Grosbous and 2nd battalion preparing to head south, in the direction of Michelbuch. 8th Company, 2/915 was trailing behind, along with the regimental trains, in the general vicinity of Feulen. After only a few hours of sleep, the company was told to water and feed the horses and move out, heading west in the dark. Moving quietly, soldiers walking and horses pulling the guns, the men advanced along the Feulen-Mertzig road, unaware of the Americans, who were dug in along the tree line to the south. By daybreak, and with Mertzig in sight, mortars and artillery began to fall, as I Company, 3/109 became aware of the Germans. “We came under fire as we entered Mertzig, but managed to reach the village without any casualties”. Being an experienced front soldier, Michely knew that the threat of artillery would diminish as soon as his men would reach cover and were out of sight of the forward artillery observer who had spotted them. To the men, Mertzig looked as though it had been deserted in a hurry, both by the civilian population as well as the Americans. 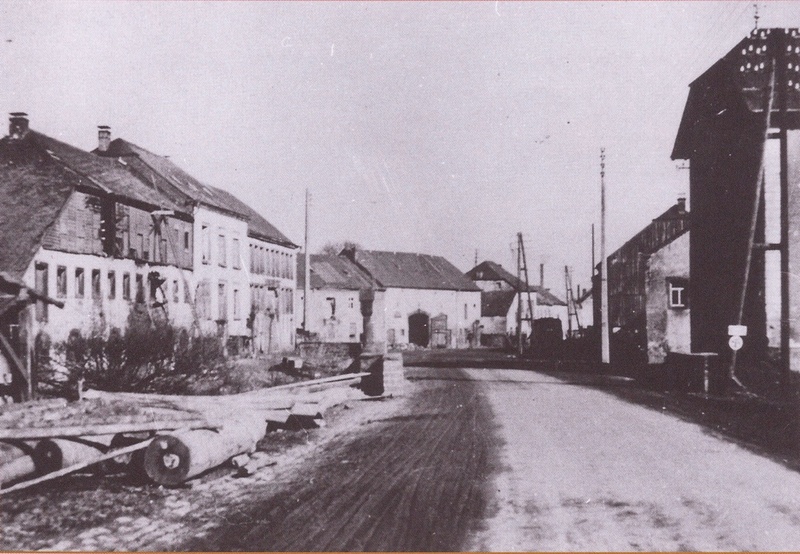 Not having been resupplied in days and feeling relatively safe, the platoon left its guns and horses in the street (in front of Hotel Schammel) and began to explore the surrounding buildings. Entering the hotel on the south side of the street, the men found the dining room empty but the beer taps full, and immediately began serving themselves. It was now mid-morning and snow started to fall. Little did Michely know that 22 December 1944 was to be his last day in combat. Image shows Hotel Schammel in 2008. Point of view is looking east, along the main road. Michely’s guns were parked facing the viewer, along the front of the building, just prior to the attack. 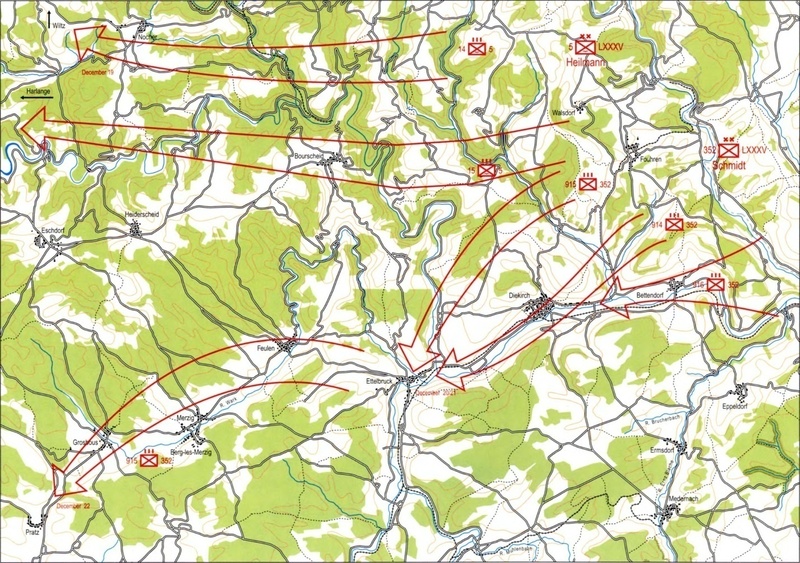 Earlier that morning, advance liaison officers of the US 80th Division made contact with their counterparts from the 28th and immediately coordinated moving the 317th, 318th and 319th Infantry Regiments through the lines and attack to the north, along the Luxembourg – Ettelbruck highway axis. Supported by units from the 702nd Tank Battalion and the 610th Tank Destroyer battalion, 3rd Battalion of the 319th Infantry Regiment was given the order to move north from Vichten into the direction of Michelbuch and attack Mertzig from the south. Moving cautiously, 3/319 had made steady progress and was now arriving at the heights, overlooking the village. While his men were celebrating in the hotel bar, Michely explored the remainder of the building, liberating copious amounts of beer and wine. It is unclear why Michely did not take part in the feast but during many conversations with the author, he expressed having developed a sixth sense while on the Eastern Front – a sense which had saved his life on several occasions. “On one end of the building was a bowling alley, with clear views to the south. To my horror, I saw American troops descending from the ridgeline only a few hundred yards away. Our guns were still harnessed to the horses and no defensive positions or security had been established. The men were completely unaware until artillery began to fall into the street moments later.” Michely had just seen the beginning of the attack by 3/319, with companies K and L abreast and M (Weapons) in reserve. “As we rushed into the street, we discovered that several of our horses had already been killed or wounded by artillery and others, cut loose and frightened, were running off into the direction of the attack, trailing behind them the wagons containing our ammunition supplies. For a moment I thought about using my weapon to shoot the horses and keep them from ‘surrendering’, but I didn’t.” The men now attempted to make the guns ready to fire, despite the completely exposed positions in the road. “I was running from gun to gun when a tank appeared next to the dairy building, only a few hundred yards away. Gefreiter Erich Otto’s gun and crew were completely exposed in the intersection of Rue Principale and Rue de Merscheid but were determined to knock out the tank.” The next events happened in a matter of seconds. “I could see the turret of the tank turning into the direction of the exposed gun and screamed at Otto and his men to take cover as I dove into the front door of a house. I don’t know if it was the tank or a direct hit by artillery, but when I looked at the gun, I saw the flash of an explosion with pieces of the gun and its crew flying through the air.” The gun and its crew, Gefreiter Otto and Obergefreiter Kirnbauer, were gone in an instant. 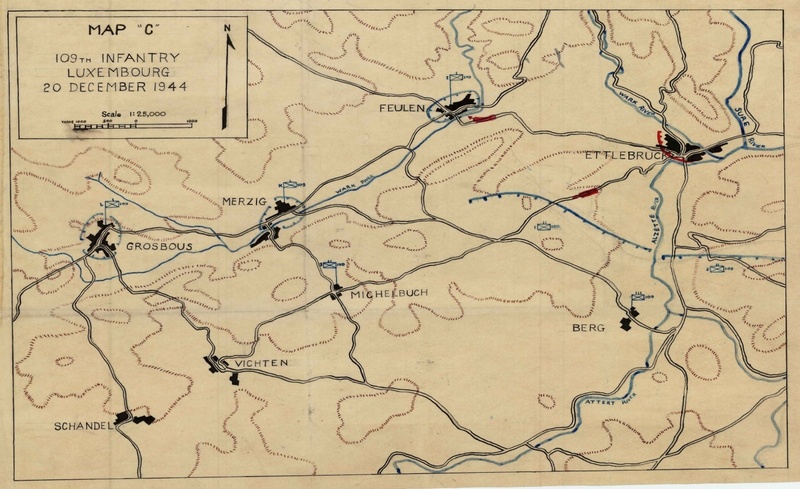 The attack on Mertzig was conducted by the 3rd battalion of the US 319th Infantry Regiment and documented in its official regimental history. Sgt. Hanright, a platoon sergeant in K Company, 319th, recalls the attack on the village. “We moved out from our positions overlooking Mertzig from the south at around 1100 HRS. Our company was on the right flank of the attack and quickly covered the open ground between the tree line and the houses on the edge of the main road. We reached a house (which I later found out to be the mayor’s house) with a fenced-in yard and three or four concrete steps leading up to the front door (Maison Rausch). Upon entering the house, we found a set of stairs to the basement and I was about to throw in a grenade when I heard a sound which made me stop. I eventually took 22 or 23 German prisoners who had been hiding in the basement.” Upon clearing the house, Sgt. Hanright’s platoon turned east and continued clearing houses along Rue Principale, using a captured German officer to encourage more troops to surrender. Shortly after leaving the basement, the group encountered Leutnant Clement, the platoon’s VB or forward observer, along with his runner. Clement was young and had only recently graduated from officer school. “He was 19 or 20 years old and had little or no experience in combat, other than what he had learned in school. After fighting in Russia, house-to-house combat was something I was quite familiar with.” Michely continues: “I realized the situation was hopeless and told Leutnant Clement that my war was over and that I intended to surrender to the Americans at the earliest and safest opportunity. I suggested that he and the rest of the men should do the same.” Leutnant Clement disagreed and ordered that the men attempt a breakout to the northeast in order to join the rest of the battalion. Michely did not think that a breakout attempt was feasible. “Where are we going to go? They’ll shoot us like rabbits!” Upon hearing Michely’s refusal, Clement warned him that he would report him to the company commander and court-martial him for desertion. “Before you can do that, you have to survive first,” countered Michely. “Against our advice, Leutnant Clement and his runner then decided to head out, attempting to cross the open meadow east of Rue de Merscheid. After only about 35 yards, I witnessed Clement get hit and tumble over, dead. His runner was shot through the collar of his greatcoat while another bullet merely grazed him in the neck – but was otherwise unharmed.” Leutnant Clement’s death now made Unteroffizier Michely the highest-ranking remaining soldier in the platoon. The house in the center is the machine house. The background also clearly shows the high ground and tree line from which the 319th attacked. After the lineup, the remaining men were assembled and transported to Mersch. Michely was elated at being alive and remembers meeting another “old salt” non-commissioned officer from his unit along the way. “We had both been through combat in Russia and were happy to have survived this one”. After being processed in Mersch, the POW’s were loaded into railway cars and transported into captivity. After several months in camps near Normandy, France, Erich Michely would return home to his family on November 13th, 1945 – his 22nd birthday. By nightfall on 22 December, the Germans held the north end of the town, with the Americans firmly dug in on the south. While all of this took place, two additional elements of the 915th met unexpected attacks as well. 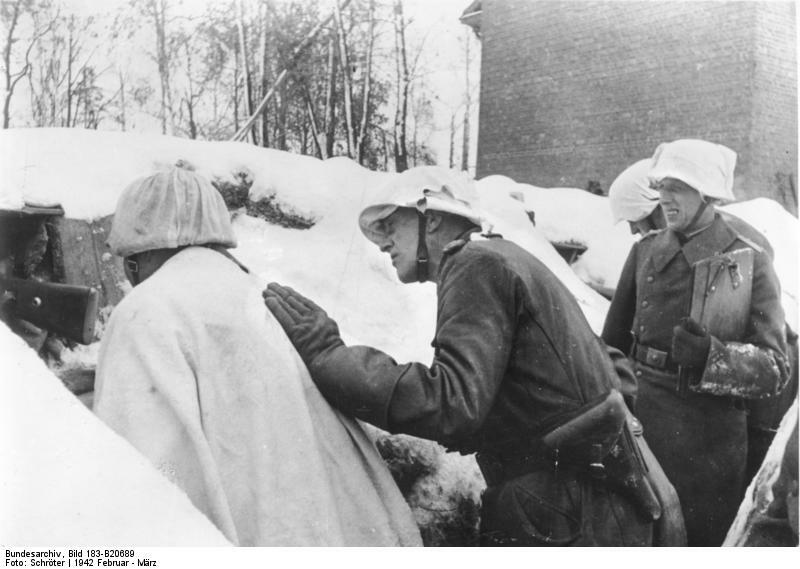 By 1000 HRS, as the snowfall began to lessen, outposts from Task Force L, who by now had moved to positions on the high ground overlooking the road from Mertzig to Grosbous, observed a large column of enemy infantry and vehicles on the move toward Grosbous. The column stretched for almost a mile and a half and consisted of several artillery pieces, vehicles, infantry and two light tanks, apparently completely unaware of Task Force L’s presence a mere 1,300 yards away. The entire column was destroyed with direct and indirect fire from Task Force L and the 108th Field Artillery Battalion. 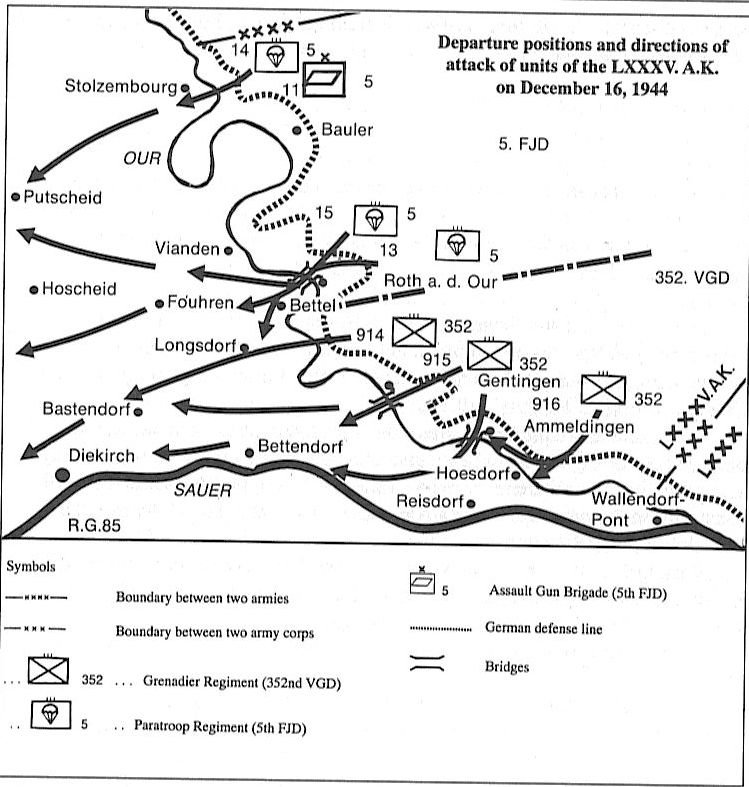 The result of the 20 minute ambush was the complete destruction of the 915th’s spearhead, at the cost of one wounded soldier for Task Force L.
By the end of the day of 23 December, Mertzig had been completely cleared of any German resistance and the German advance had ground to a halt just west of Grosbous. 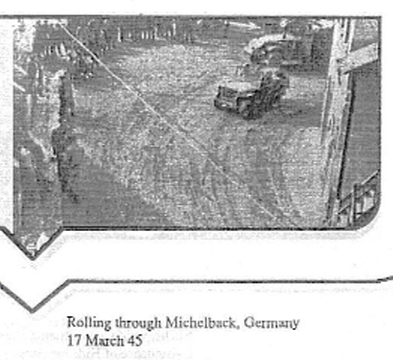 Cut off from reinforcements, the remaining troops of the 915th were ordered to abandon their heavy equipment and break out, making their way back to Ettelbruck. Over the course of the next month, the Regiment continued to take part in defensive operations in the Ettelbruck bridgehead, eventually falling back to its original positions across the Our on 21 January, 1945. Hitler’s final offensive in the west had been stopped, at a cost of 8,000 men to the 352nd VGD alone. By March of 1945, Germany was defeated and only weeks away from unconditionally surrendering to the Allies. 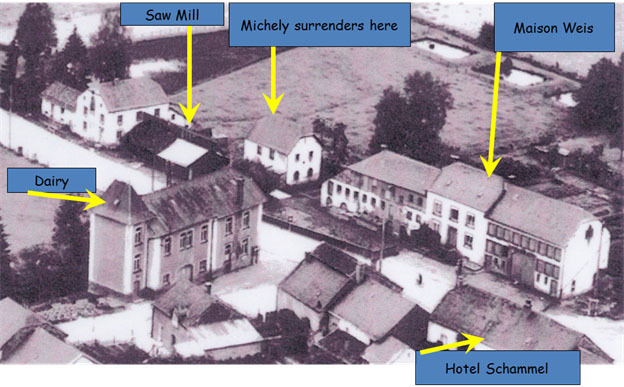 Ironically, the same unit who took Michely prisoner, would eventually capture and briefly occupy his home town as well, entering Michelbach, Germany on 17 March 1945. Erich Michely still resides in Michelbach today, along with his wife of 61 years, Loni. Upon his return from captivity, he started a family which eventually grew to 4 children, 5 grandchildren (with a 6th on the way) and one great-grandchild. He spent his life as a construction worker and forester and enjoys his garden and apple orchard. On 22 December 2008, 64 years to the date, he revisited Mertzig, Luxembourg, where he was received with open arms and retraced his steps of his last day as a soldier. Claude Staudt (mayor of Mertzig), Fernand Pletschette, Marcel Michely, Erich Michely, Manfred Michely, Jos Clees, Roland Gaul. Picture taken 22 December 2008, on the steps of Maison Weis. Marcel and Manfred Michely, sons of Erich Michely, both of whom spent countless hours researching and countless dollars on long-distance phone conversations with the author. 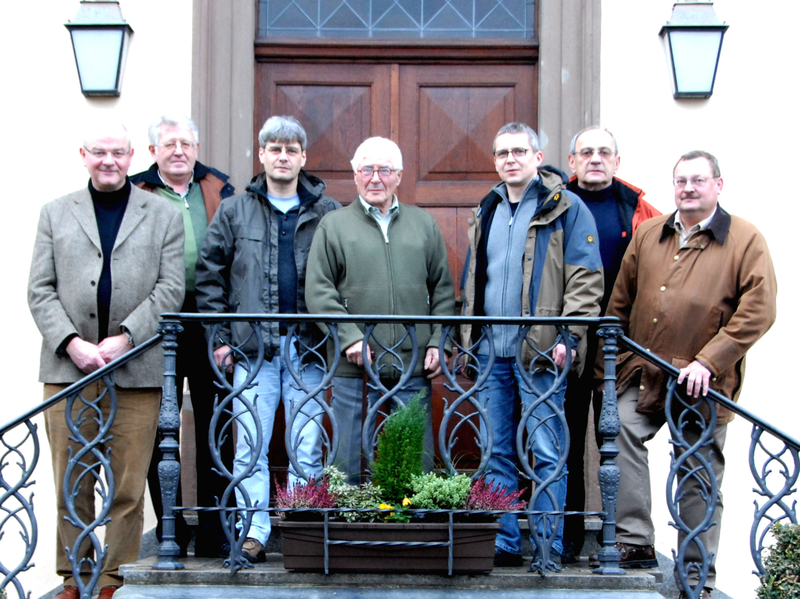 Fernand Pletschette, Erny Kohn and the remaining members of the Mertzig Historical Society. 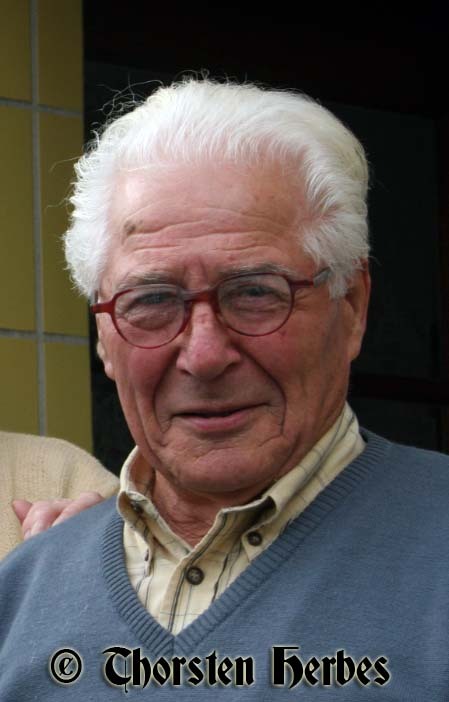 Fernand answered the author’s e-mail out of the blue and was instrumental in pulling in local information, finding images, composing presentations and coordinating Michely’s visit to Mertzig in 2008. Claude Staudt, honorable mayor of Mertzig, who welcomed Michely with open arms and open doors. Roland Gaul, curator of the Luxembourg National Military Museum, for his knowledge and willingness to help. Mr. Gaul’s books are a one-of-a-kind resource and his work is extraordinary. Robert Hanright, Robert Murrell, Bill Krehbiel and Clement Good for assisting the author in obtaining American eye witness accounts. Kyla Herbes for being a trooper and encouraging the author’s obsession. Finally, and most importantly, Erich Michely, the inspiration for this project and to whom it is dedicated.. It is through your experiences that we can hope to remember the past and learn from it. Opa, thank you for always indulging me with your stories. Thank you for your example and courage. 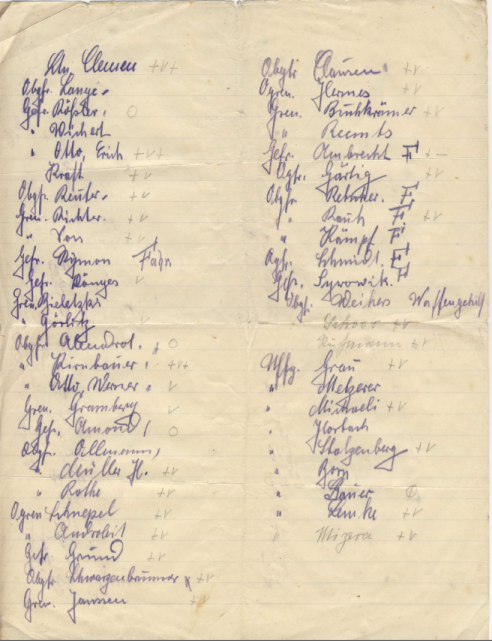 Michely’s hand-written list of company members. A “V” after the name denotes vermisst (missing), a cross indicates killed. Collins; Keegan John, ed. Atlas of the Second World War. Ann Arbor, MI: HarperCollins in association with Borders, 2003. Fossum, Embert. The Operations of “Task Force L”, 109th Infantry (28th Division) near Grosbous, Luxembourg 20 -23 December 1944. Fort Benning, GA: US Army Infantry School, Advanced Infantry Officers Course, 1948. Gaul, Roland. The Battle of the Bulge in Luxembourg: The Southern Flank, December 1944 – January 1945. Volume I: The Germans. Atglen, PA: Schiffer Military, 1995. Gaul, Roland. The Battle of the Bulge in Luxembourg: The Southern Flank, December 1944 – January 1945. Volume II: The Americans. Atglen, PA: Schiffer Military, 1995. Janes, Terry D. Patton’s Troubleshooters, Revised Edition. Kansas City, MO: Opinicus Publishing, 2006. Krehbiel, Bill J. The Pride of Willing and Able. Published by Krehbiel, 1992. Murrell, Ed. 319th Infantry History, ETO 80th “Blue Ridge” Infantry Division. Oakmont, PA: Published by Author, year unknown. Quarrie, Bruce. Order of Battle 12: The Ardennes Offensive, I Armee & VII Armee. Oxford, UK: Osprey, 2001. Quarrie, Bruce. Order of Battle 13: The Ardennes Offensive, US III & XII Corps. Oxford, UK: Osprey, 2001. Schmidt, Otto E. After Action Report, 352nd Volksgrenadier Division. Location, publisher and date unknown. Schmidt, Otto E. “Project 22” Ardennen Offensive. Location and publisher unknown, 1950. US War Department. Handbook on German Military Forces. Baton Rouge, LA: Louisiana State University Press, 1990. Infantry Regiments 914 and 915 were formed from navy troops, while 916 was drawn from air force personnel. See Appendix for detailed listing. Author’s note: There were 4 le. I.G. 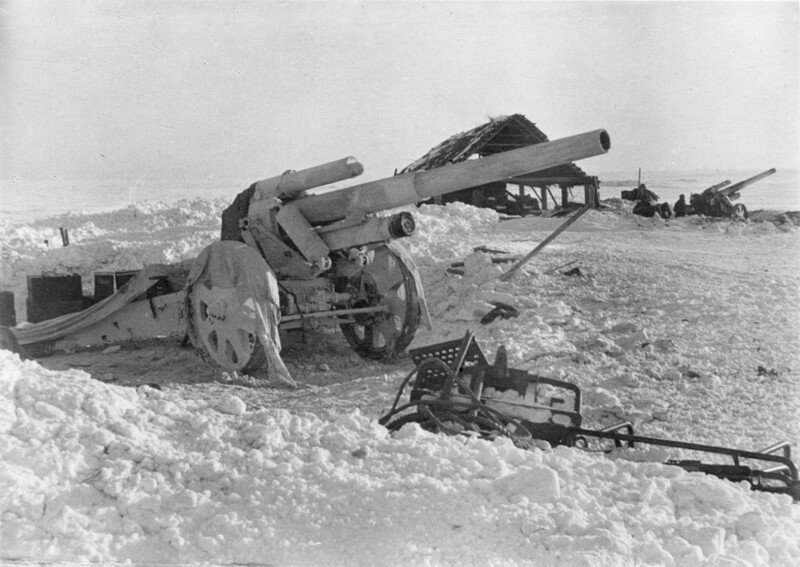 42 75 mm infantry guns in the company. Each gun was led by a non-commissioned officer (Unteroffiziere Grau, Lemke, Mizera and Michely). Although Michely had thought about deserting, he knew that his family would be punished for his actions – a common practice near war’s end. He did, however, promise his father to attempt to go into captivity as soon as it was safely possible. The author has been unable to confirm the loss of two tanks near Tandel throughout his research, but believes the story to be true. It was this story which sparked the entire research project for the author. After hearing it for the first time in September 2008, the author decided to drive to Bastendorf to take pictures of the church and find out if any shell damage remained. As it turned out, a new church was built in 1948, replacing the old one. Image courtesy of Fernand Pletschette. Rue de Michelbuch runs along the bottom of the image, while Rue Principale stretches from bottom-right to top-left. The first three building along the right side of Rue Prinicpale are Maison Weis, the machine house and the saw mill. Hotel Schammel is on the left side of Rue Principale, first house on bottom-right corner. Image courtesy of Fernand Pletschette. 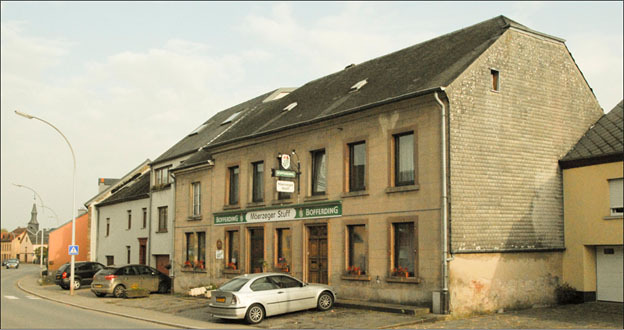 Image shows Hotel Schammel in 2008. Point of view is looking east, along the main road. Michely’s guns were parked facing the viewer, along the front of the building, just prior to the attack. Author’s note: Michely was also quite displeased at having his meal ‘interrupted’ by the attack. Author’s note: Michely later recalled a second tank, moving west-to-east along Rue Principale. It is plausible that Gefr.Otto’s gun and crew were killed by a round from this second tank. Image courtesy of Fernand Pletschette. Image shows Rue Principale in 1944, looking east. Maison Weis is on the left, the dairy building on the right. Obergefreiter Otto and Gefreiter Kirnbauer died in the intersection immediately past the second building on the right. Author’s note: Based on research, the open ground may have been the meadow immediately west and south of the dairy building, with trees running parallel to Rue de Michelbuch. On 22 December 2008, Michely returned to Mertzig and was able to locate the basement room which had once saved his life. The ceiling had changed, but the metal flap doors covering the entrance were still there and he recognized it immediately. Author’s note: An avid opponent to war then and now, Michely always maintained the righteousness of his decision to surrender and does not see his decision as desertion. To him, the insanity of continuing an already lost war was not worth his own death. The decision to surrender was made by each individual member of the platoon and of their own free will. Leutnant Clement is still officially listed as “missing”. Michely also told the author about being upset that he had been forced to give Clement his “good” compass earlier, which was now also lost. Author’s note: There appeared to be a lull in the fighting, or at least the amount of incoming fire had decreased substantially. Author’s note: Neither the machine house nor the saw mill exist today. 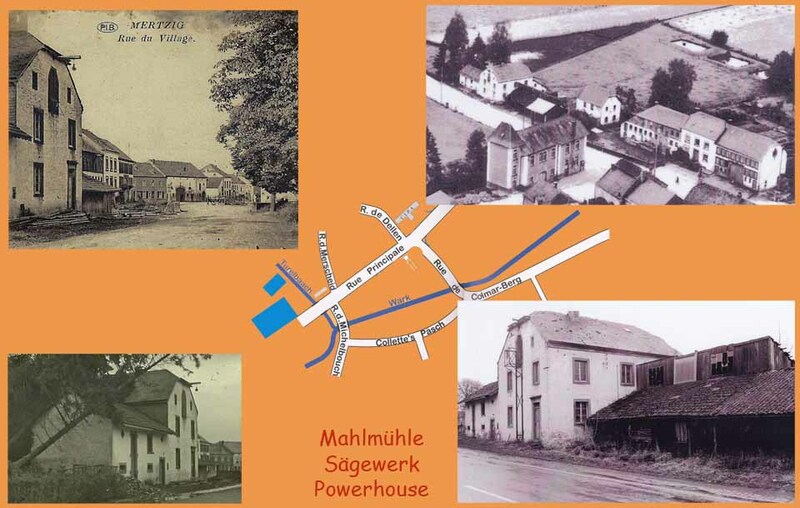 The machine house was torn down in the 1970’s and in its place (and the former saw mill) is now the Centre Turelbach, a community center. Maison Weis still remains and is Mertzig’s village hall today. Image courtesy of Fernand Pletschette. The house in the center is the machine house. The background also clearly shows the high ground and tree line from which the 319th attacked. Michely’s recollection. He does not know whether Leutnant Clement’s runner was with them or not. Author’s note: One of Michely’s men was Polish and claimed to have heard the American troops request a flame thrower. Whether he spoke English or whether there were Polish-speaking GI’s remains unclear. The machine house contained a paddle wheel, driven by the Turelbach, which was re-routed through the basement for this purpose. Authors’ note: According to research, these steps were on the northwest corner of the building. Image courtesy of Fernand Pletschette. 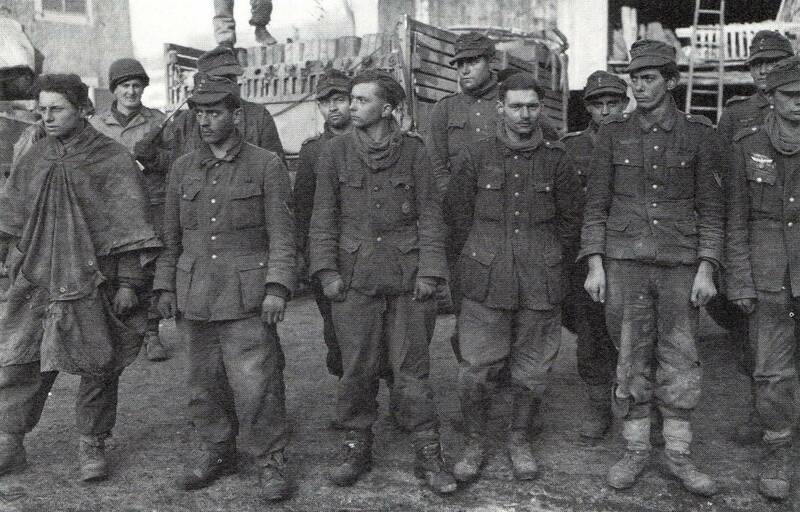 German POW’s (likely from the 915th regiment) await transport into captivity in Mertzig. Fossum, page 36. By 24 December, 352nd’s strength was estimated at 5,000 men. Image courtesy Fernand Pletschette. Left to right: Claude Staudt (mayor of Mertzig), Fernand Pletschette, Marcel Michely, Erich Michely, Manfred Michely, Jos Clees, Roland Gaul. Picture taken 22 December 2008, on the steps of Maison Weis. Courtesy of Erich Michely. PLEASE DO NOT COPY OR PUBLISH!